Bring the fall colors to the inside of your home with this beautiful Harvest Time rug. 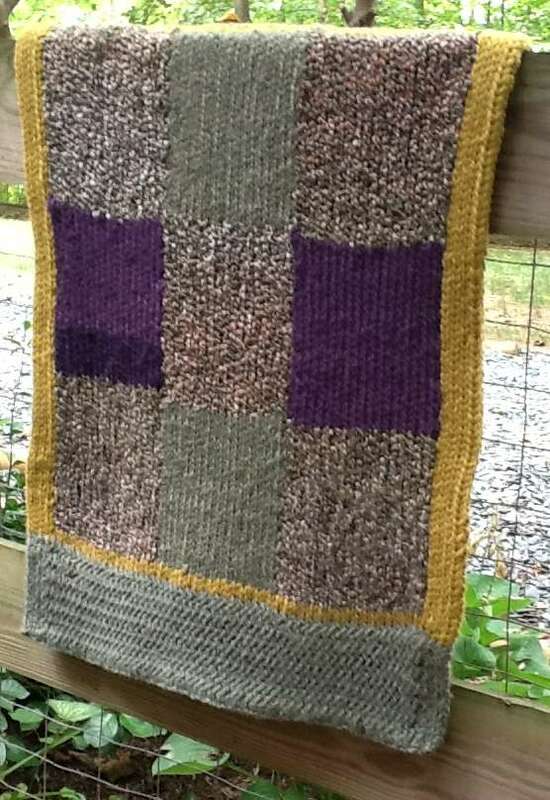 With our little rug in ‘veggie’ colors of Eggplant purple, squash yellow, and herbal greens as a great reminder. It’s fun and easy to knit and very durable. Loom: 28” Knitting Board + Peg Extenders Loom. 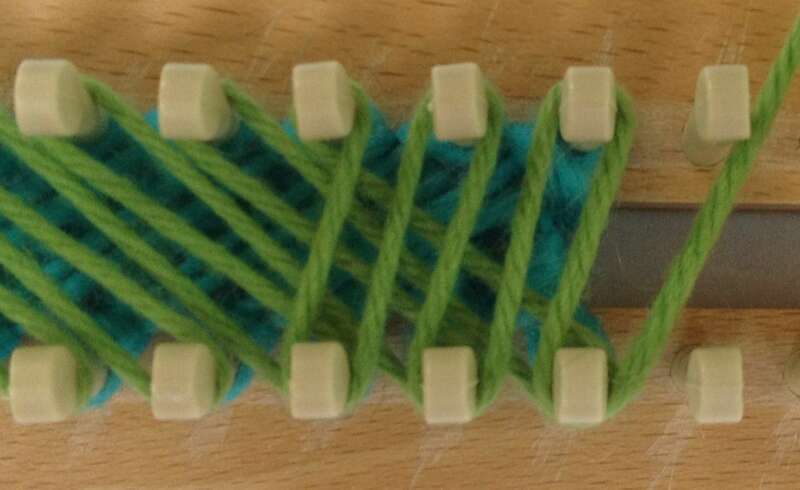 Set up as double knit with smallest setting of wood spacers-No extenders needed. Yarn: Lion Brand Wool-Ease Chunky, 80% Acrylic and 20% Wool, 153 yds per skein. Machine Washable. Colors used #173 Willow (G), #131 Moss (M), #144 Eggplant (E). Lion Brand Homespun (H), 98% Acrylic and 2% Polyester, Color Green, 185 yds per skein. Machine Washable. Purchase (2) skeins of each of the (4) yarns so you can have 2 skeins to pull from. You will only use the yardage of one skein so they can be partial skeins. 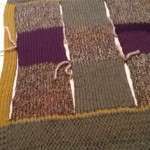 If you plan to make a longer rug, you will need additional yarn or the 2 full skeins of each color. Notions Needed: Knit Hook, Crochet hook size 5, Large darning needle, Scissors. Cast On in stockinette stitch, 62 stitches in center of loom. Color (G). 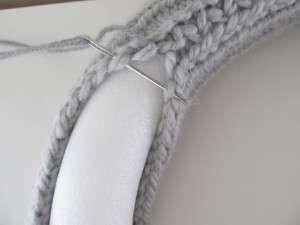 Change to ZigZag stitch. Work (2) rows in Stockinette with (M) yarn. 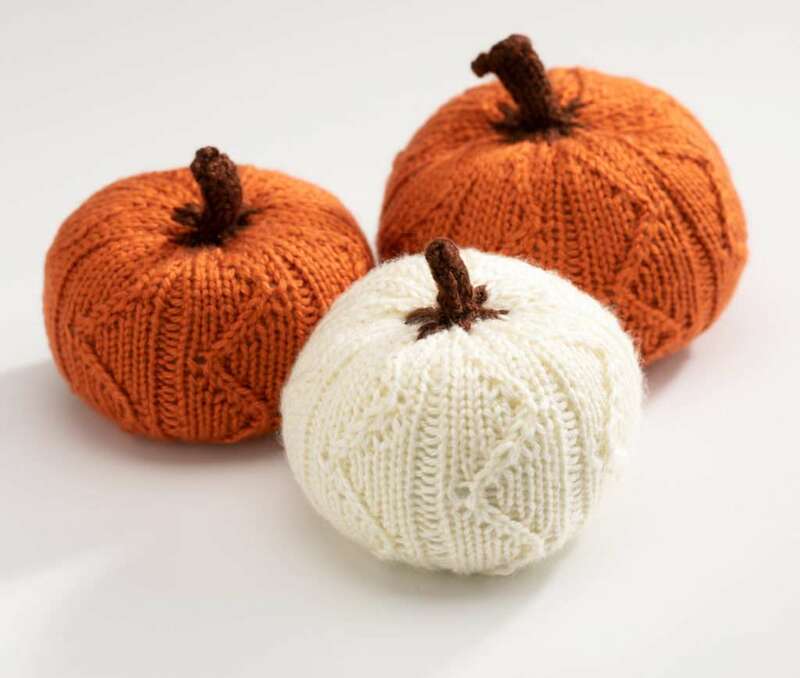 Do not cut the yarn as it will be used for the border of each row. You will now tie on the yarns to create the (3) sections of color. Tie on color (H) at 5th stitch. Tie on color (G) at 23rd stitch. Tie on another skein of (H) at 42nd stitch. Tie on another 2 strands of (M) yarn at stitch 58. You can pull from both ends of the Moss yarn skein to get the double strands from one skein. You should work full rows of all colors to be sure the sections are equal. If you want to twist at each joint of color, it will keep the yarn sections attached, but the yarns will get very tangled. The option is to just allow the sections to be separate. We will seam them together at the end. This method is much faster and easier, and preferred. Place the skeins in front of your knitting. 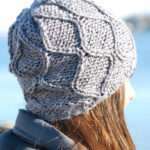 Work in Stockinette Stitch for all sections. Work (4) stitches (M) yarn, (18) stitches (H) yarn1, (18) stitches (G) yarn, (18) stitches (H) yarn2, (4) stitches with 2nd (M) yarn. Work all for (25) rows. Cut the center yarns leaving 2” tails. Do not cut the (M) yarns at beginning or end of loom. This border will continue on all sections. Tie on (E) yarn at stitch (5) stitch attaching to (H) yarn. Tie on (H) yarn at stitch 23 attaching to (G) yarn. Tie on other skein of (E) yarn at stitch 42 attaching to (H) yarn. Lay yarn tails on the knitting between the pegs. Work all for (25) rows. Cut the center yarns leaving 2” tails. Do not cut the (M) yarns. Tie on the (H) yarn, the (G) yarn, and the 2nd skein of (H) yarn. Work all for (25) rows. You are now ready to add the stripe (M) rows. If you choose to make your rug longer than 28”, you can repeat another 25 row section before doing the (M) stripe. 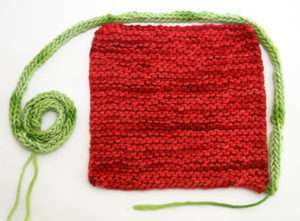 You will continue working with the first 2 strands of (M) yarn. Cut all the others leaving a 2” yarn tail including the 2nd double strand of (M) yarn at end of loom. Work (1) rows of (M) yarn across all stitches. When you get to each of the yarn tails, stop and tie the yarn tail onto the working yarn, and then continue to end of row. Repeat (1) additional row. Cut and knot the 2 strands of (M) yarn. Tie on (G) yarn. Work in ZigZag stitch for (16) rows. Cut the (G) yarn leaving 2” yarn tail. Bind Off of loom using a basic 2-loop bind off starting at end of loom opposite the yarn tail. 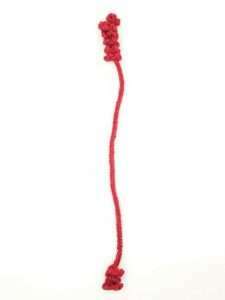 Use the yarn tail to create a knot with the last loop. Bind Off at anchor yarn starting at edge opposite the yarn tail. 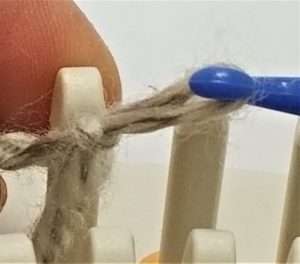 Once complete, you can carefully remove the anchor yarn. Pull in any yarn tails that are exposed. 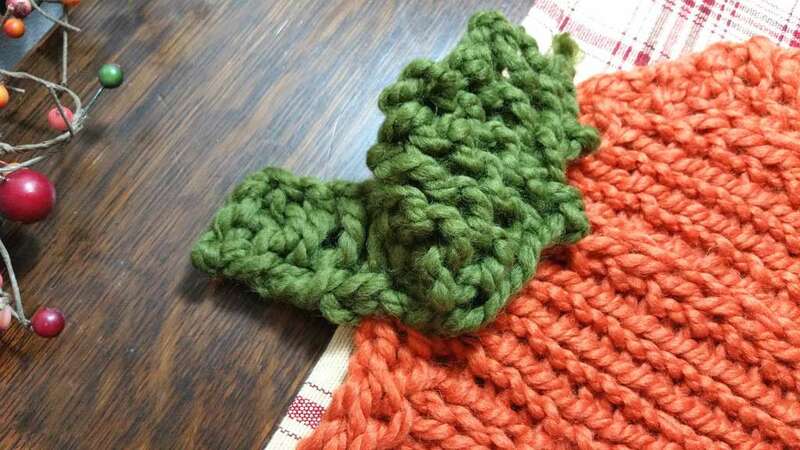 Connect all corners of color sections with a small piece of scrap yarn before doing the stitching. Then work the pieces together by sewing with an invisible stitch so that the sewing does not show. 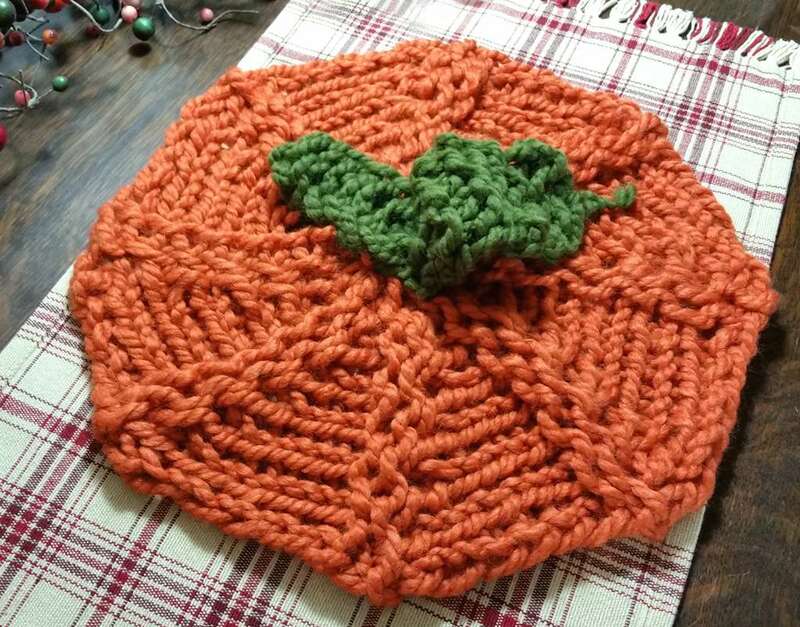 Once complete, your ‘Veggie’ Rug is ready to use. 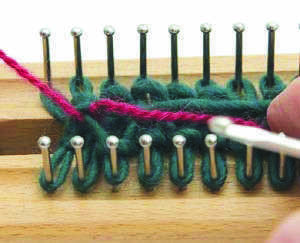 This stitch is created by weaving every peg, front to back, across the loom at an angle. Then the next row is done at the opposite angle. This is what creates the ‘zig’ and the ‘zag’. 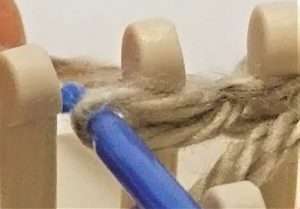 In order to get all pegs covered, it is necessary to wrap the first 3 pegs at both ends with a straight weave also. We will use 2 different yarns to illustrate. Start the row by weaving front to back on first 3 pegs. Be sure to start by noting from which side the yarn is coming, and continue in that direction. 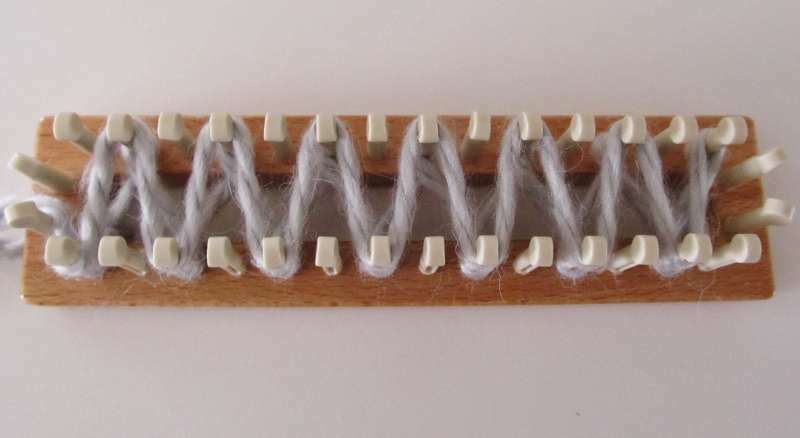 Now, going back to peg 1, weave the diagonal weave across the loom covering all pegs with a new loop. Note that the weaving is going in opposite direction from previous row. When you get to end, yo u must repeat the straight weave on last 3 pegs so that all pegs have a new wrap. This will result in one side of loom with an extra wrap on last 3 pegs. Same situation on the first 3 pegs. If you pegs have both the straight weave and the diagonal weave, this is a thick side. If you only have the straight weave on the 3 pegs, this is your thin side. When you hook over all pegs on the row, lift one over one. If you have 3 loops, lift 1 over 2 on the thick side, and lift 2 over 1 on the thin side. Now, weave the next row at opposite angle. 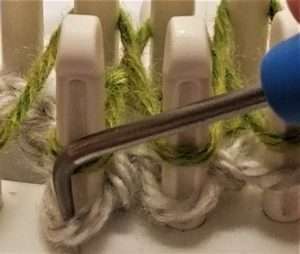 If you start and you see it’s the same angle, this means that you started on the wrong side of loom. Go back and wrap again. The rug looks great. How hard is it knitting with two strands of such thick yarn if one has a touch of arthritis? The two strands are not harder to move than a single strand of super chunky yarn. I just suggest that you go slower pace so that both strands get worked as one. Also, relax with the stitches and they will be comfortable to move. Loom: All-n-One Loom or 28″ Loom, plus a set of loom extenders. T-Shirts: 1 orange, yellow, peach, green and white t-shirts and 2 grey t-shirts with minimal text or graphics. Fold the t-shirt in half , lining up the sleeves. Smooth out the wrinkles with your hand. Cut off the bottom band. Measure and cut a 2” wide strip across the shirt through both layers. Trim off the seam ends. With the fabric still folded in half, cut a slit straight up the center until about a ¼ inch from the end. You now have 2 strips with slits up them. Round off the corners. Take one strip and pull it taught while holding onto each end. 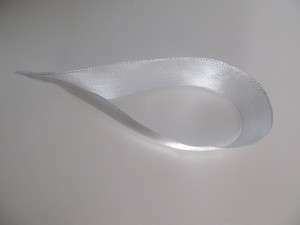 The strip will stretch, the edges will curl in and you now have a warp loopie. Make 2 green warp loopies, 9 yellow and 9 orange warp loopies for a total of 20. To make the weft loopies , Cut 8” x 2” strips of the t-shirt. (Use every scrap of the t-shirt, including sleeves). Fold each strip in half, cut a slit up the center and round off the edges. 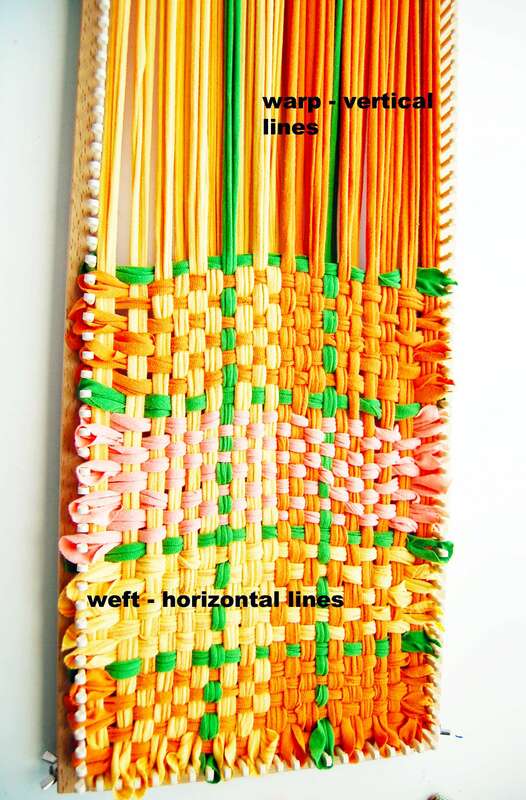 Make 22 peach, 17 orange, 15 yellow weft loopies. Warp the loom in the following color order 6 yellow, 1 green, 3 yellow, 3 orange, 1 green, 6 orange. 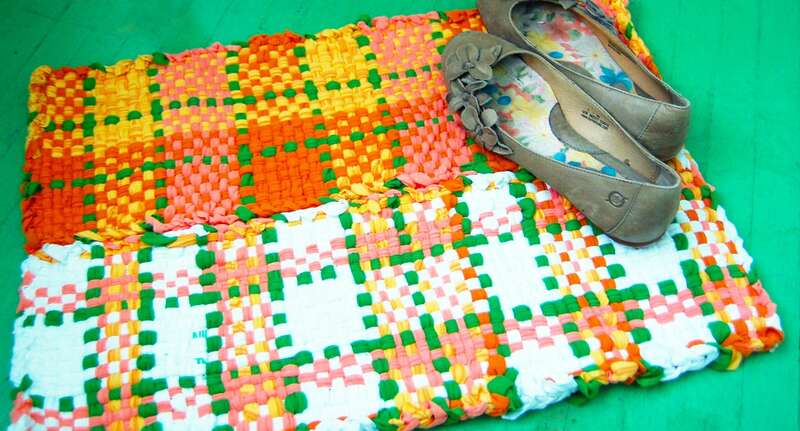 Weave in a basic over and under manner the following color sequence: 5 orange, 1 green, 5 yellow 1 green 8 peach 1 green 6 orange, 1 green, 5 yellow, 8 peach, 1 green, 7 orange, 1 green, 5 yellow, 1 green, 7 peach. When you finish weaving in the last strip, crochet bind off the fabric off of the loom. Use a J hook and lift the first loop on the top of the warp onto your hook, proceed and add the loop next to it. Then lift the first loop up and over the second loop, proceed to the third loop and place it on your hook, then take the 2nd loop and lift it up and over the third loop, you will continue in this fashion all the way around the loom, until only one loop remains on your hook. You will pull this loop and weave it into the structure of your weave using either your hook or a tapestry needle. 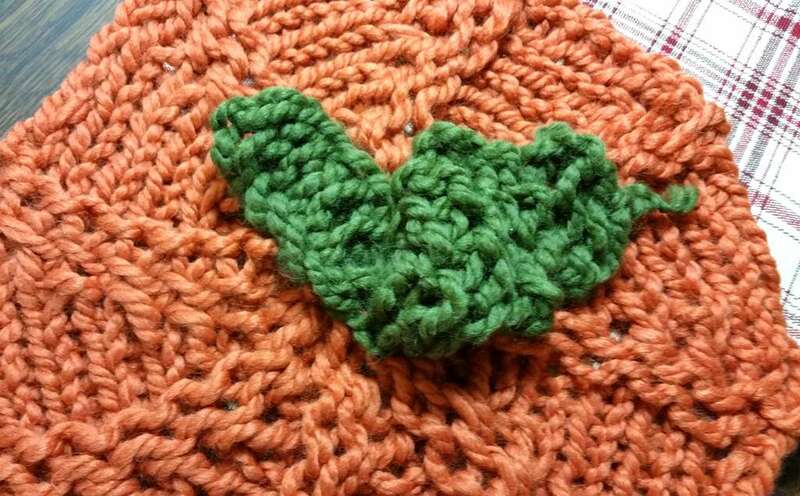 Seam your 2 pieces together with yarn and tapestry needle. Hi Dana, Sorry we do not have pics of this step. I will send your question to the designer for you. Thanks. Just a note for folks, was in Hobby Lobby the other day and notice they have T-shirt knit on a cone in different colors already cut. If anyone is interested. With the warmer weather comes those special events we all love: pot lucks, barbecues, family reunions, and sports outings. 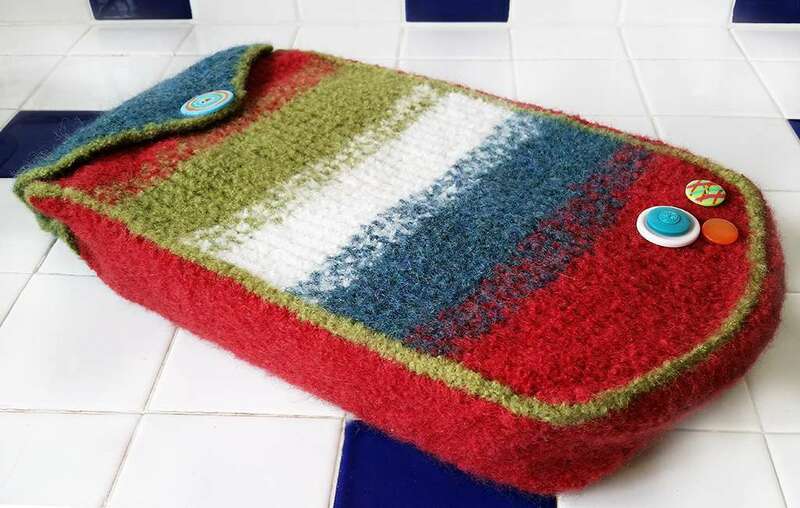 This project is exactly the thing needed to keep those tasty dishes insulated while transporting them to their destination. 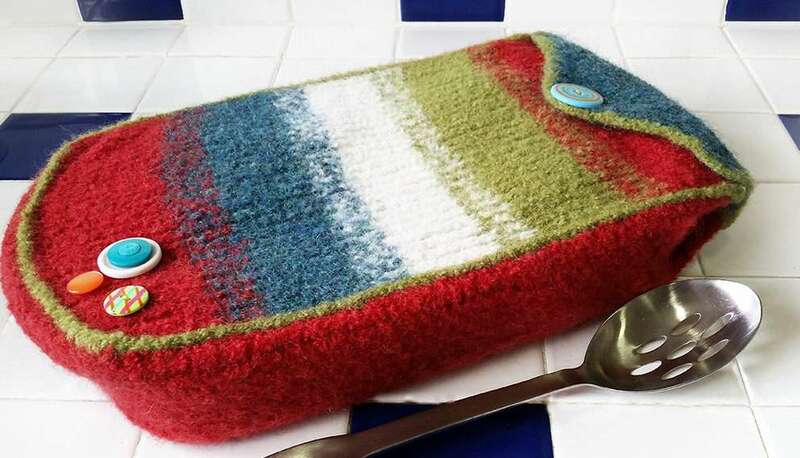 The thick felted wool creates the perfect barrier to help hot dishes remain hot and cold ones stay chilled in the sun’s warming rays. 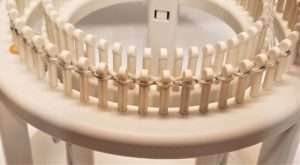 Knitting Loom: KB Hat Loom set to large gauge (pegs in every other hole), 28 pegs used. Yarn: Approximately 950 yards of worsted weight 100% wool yarn, two strands held as one. Sample used Patons Classic Wool Worsted (2 skeins in each of the colors Jade Heather and Rich Red, 1/2 skein in the color Leaf Green, 1/4 skein in the color Winter White) 210 yds/192 m.
Notions: knitting tool, 6mm crochet hook (for cast on and help with possible missed stitches, etc), stitch markers, scissors, knitting pins, yarn needle, row counter, one large and a few small decorative buttons, as desired. 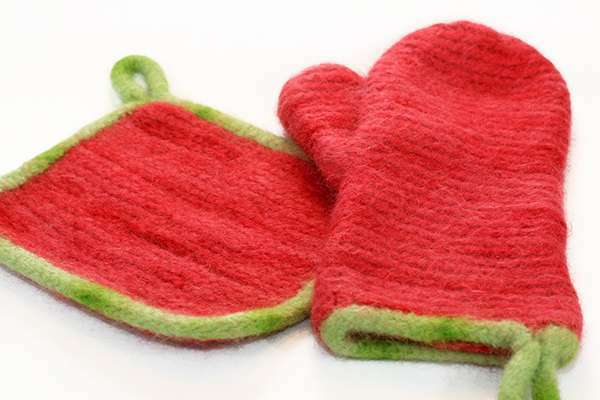 Also needed for felting process: hot water, either in washing machine or in large tub, 1 tablespoon laundry soap or baking soda, thick towels, old jeans or dryer balls to aid in the felting process if using a washing machine. 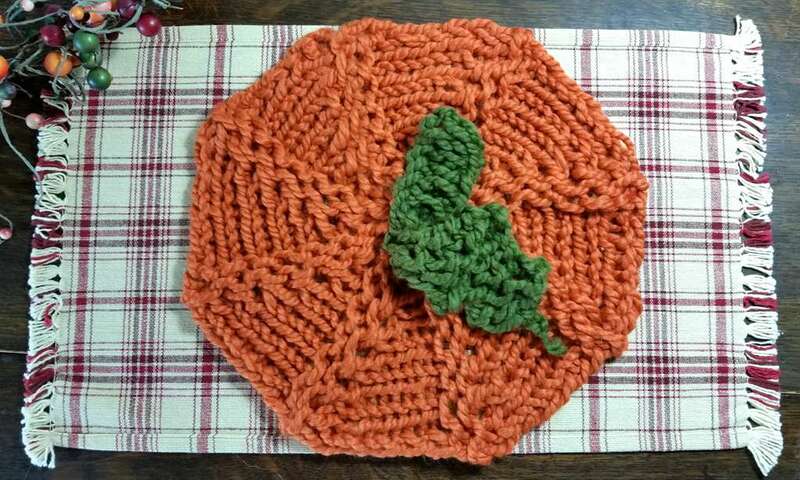 Skills Needed: E-wrap, Chain CO (or CO of your choice), Basic BO, seaming method of choice (sample used single crochet), felting techniques. The instructions below are for the exact color combination used for the sample. If another look is desired, simply work in the color pattern of choice, keeping the total row count the same as the original. 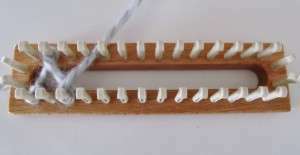 Set loom to work in a flat panel using 28 pegs in every other hole. 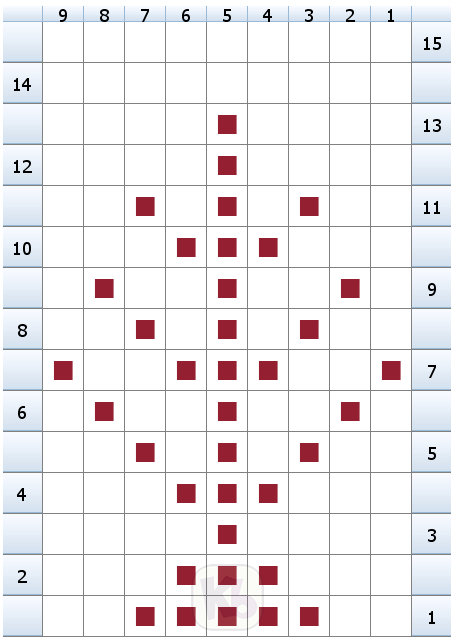 Rows 1-11: Work EW on all 28 pegs using 2 strands of Rich Red. Rows 12-16: Cut 1 strand of Rich Red to 4″ and hold 1 strand of Jade Heather with uncut strand of Rich Red and work EW on all 28 pegs. Rows 17-27: Cut strand of Rich Red to 4″ and hold 2 strands of Jade Heather and work EW on all 28 pegs. 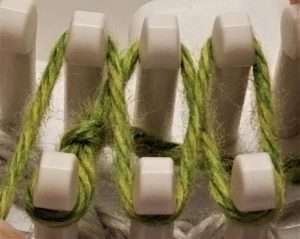 Rows 28-32: Cut 1 strand of Jade Heather to 4″ and hold 1 strand of Winter White with uncut strand of Jade Heather and work EW on all 28 pegs. 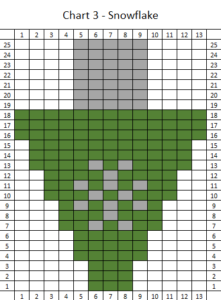 Rows 33-43: Cut strand of Jade Heather to 4″ and hold 2 strands of Winter White and work EW on all 28 pegs. 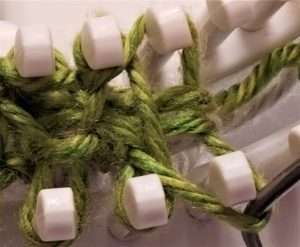 Rows 44-48: Cut 1 strand of Winter White to 4″ and hold 1 strand of Leaf Green with uncut strand of Winter White and work EW on all 28 pegs. Rows 49-59: Cut strand of Winter White to 4″ and hold 2 strands of Leaf Green and work EW on all 28 pegs. Rows 60-64: Cut 1 strand of Leaf Green to 4″ and hold 1 strand of Rich Red with uncut strand of Leaf Green and work EW on all 28 pegs. 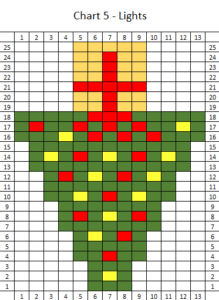 Rows 65-75: Cut strand of Leaf Green to 4″ and hold 2 strands of Rich Red and work EW on all 28 pegs. Loosely BBO all 28 pegs. 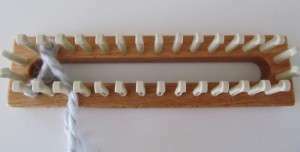 Rows 1-88: Work EW on all 28 pegs using 2 strands of Jade Heather. 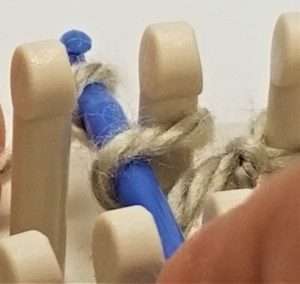 *Move the loops from the 2nd pegs from both edges to the outside pegs. *KO the bottom loop over the top loop at the outside pegs. 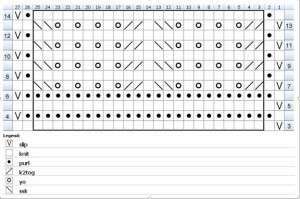 *Move the loop from the outside pegs inward one peg to fill in the gaps. 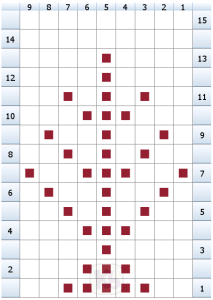 Rows 1-200: Work EW on all 12 pegs using 2 strands of Rich Red. Loosely BBO all 12 pegs. 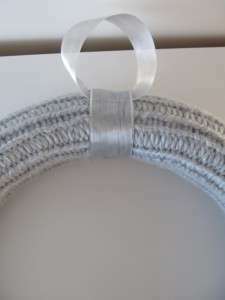 Weave in all ends that will be visible at the opening, and simply make a square knot and trim all other ends. **Please Note! ** During felting, the wool will shrink significantly. Careful watch over the felting process is required to ensure that the piece doesn’t shrink too much. If using a washing machine, place the piece inside a laundry bag or tightly tied pillow case before felting. 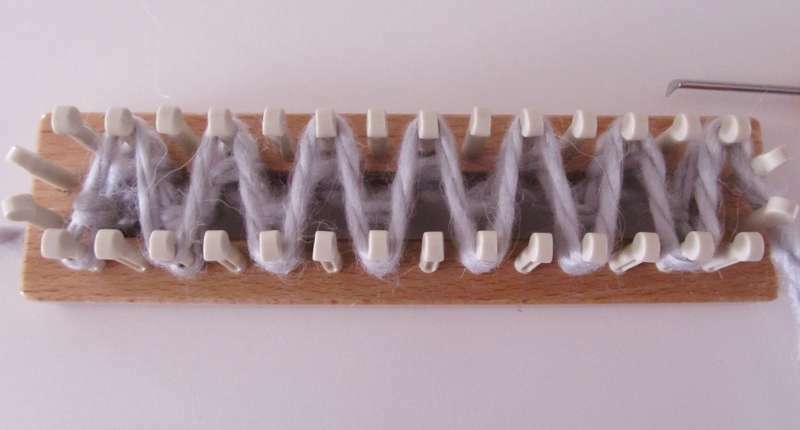 This will help keep the extra fuzz produced in the felting process from clogging the machine. Set the machine to the hot/normal cycle and add a pair of old jeans or two (ones that will not bleed color) or dryer balls for plenty of agitation. Add a tablespoon of laundry soap or baking powder to help soften the wool fibers. Let the cycle run for approx 15-20 minutes, checking regularly to make sure of the size of the finished piece. **Don’t leave them unchecked too long, as it can quickly shrink beyond what is expected! If the machine is felting the piece unevenly, simply add friction by hand to those places that still require extra felting. This allows better control over the felting process so that certain areas don’t felt too much. Alternately, felting can be accomplished using a large tub filled with hot water and plenty of applied hand agitation with good success. An ice cube tray, or a new plunger can also be used for added friction. Once the desired size has been achieved, rinse piece with cold water. Carefully squeeze out excess water without ringing. Roll cozy in a thick, absorbent towel. Working while the piece is still damp, carefully stretch the sides of the panels so that they are straight and even and are at the correct measurement. Insert desired baking dish and fit the cozy to its shape (sample’s dish had handles to mold the felting around, but this was done quite easily, because the wool was still damp and pliable). Stretch and push the piece as needed, pinning the flap in place. Leave to dry completely. **Note: Because felting will continue to shrink a bit as the moisture in the wool evaporates, continue shaping during the drying process, so that the project will remain in the desired shape. Using sharp scissors, cut a small slit in the center of the tapered point of the button flap, along the same direction as the knitting. The felting process will have firmly knotted all the fibers together, so the knitting can be cut into without worry. 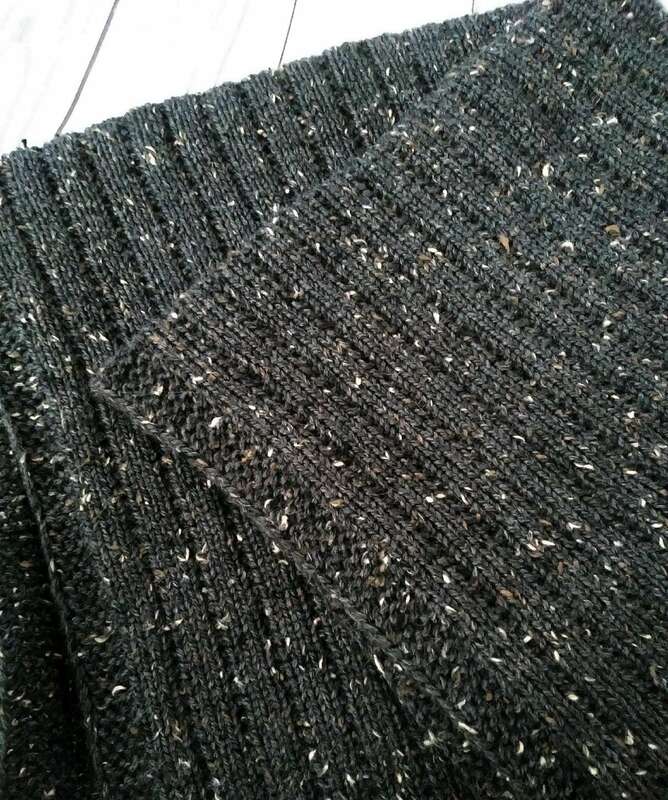 If desired, the slit can be reinforced with some stitches of yarn. Stitch the button(s) onto the corresponding place on the top panel where the button flap will close, as well as anywhere else desired for decoration. 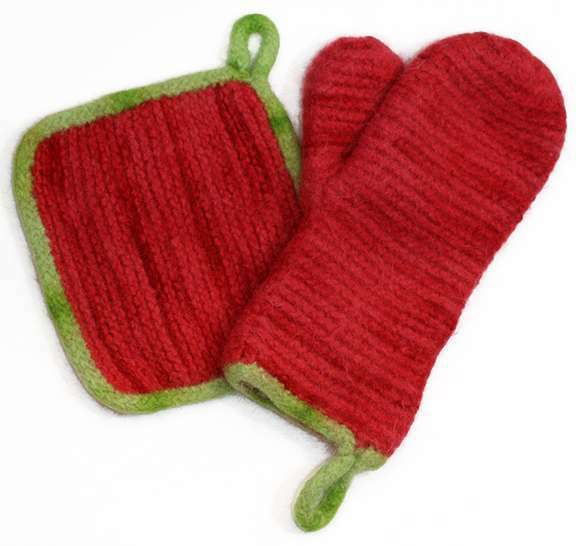 Add a special touch to your kitchen with a set of customized oven mitt set. Makes and excellent hostess gift too! 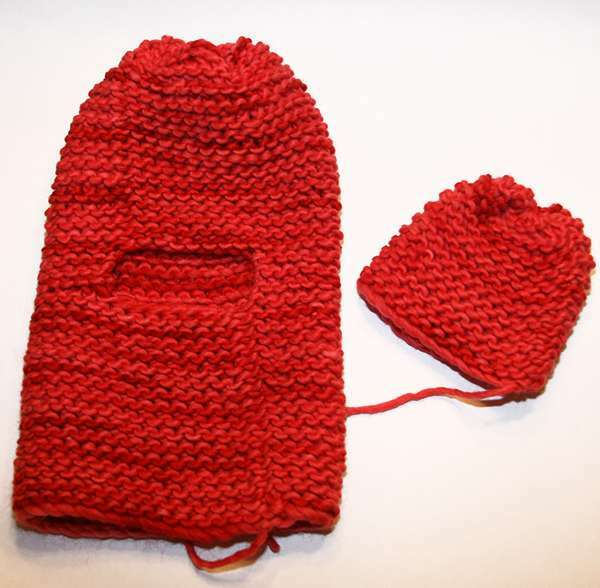 Worked in garter stitch and felted to provide the user with a thick fabric that will keep the heat away from the fingers. GAUGE: Approx 3.5 sts x 4 rows = 2 inches (gauge not imperative). Hot pad: Before felting 10×10 inches. After felting 8.5 x 8.5 inches. Oven Mitt: Before felting 14×8 inches. After felting 12 x 7 inches. PATTERN NOTE: Both items are worked completely with the ewrap knit stitch. 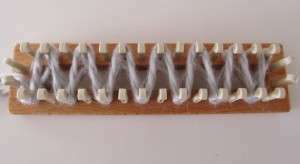 Set knitting loom XS setting-with pegs every other hole, 28 pegs. Using MC, CO 28 sts, prepare to work a flat panel. Row 1: e-wrap k to the end of row. Rep Row 1 and Row 2: until item measures approximately 9.5 inches from cast on edge. Using CC, CO 3 sts, prepare to work a flat panel. Work a 3-stitch i-cord that is approx. 45 inches long. Set knitting loom Medium setting-with pegs every other hole, 40 pegs. Using MC, CO 40 sts, prepare to work in the rnd. Rnd 1: ewrap k to the end of rnd. Rnd 2: p to the end of rnd. Rep Rnd 1 and Rnd 2: 15 more times (total of 30 rnds). (16 garter stitch ridges). Next row: p back (p32). Next row: Ewrap k to the end (32 sts). Next row: Ewrap k to the end, CO 8 sts at end of row. (Begin working the rnd again). *Next rnd: ewrap k to end of rnd. Rep from * to *: 14 more times. (total of 28 rnds). (16 garter stitch ridges from thumb opening). Using MC, CO 28 sts, prepare to work in the rnd. Rnd 2: p to end of rnd. Rep Rnd 1 and Rnd 2: 11 more times. (total of 22 rnds). (12 garter stitch ridges. 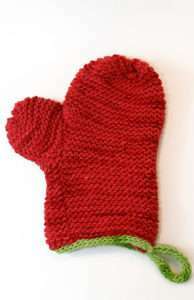 Assembly of Oven Mitt: Using the mattress stitch and MC, seam the thumb to the thumb opening in the thumb. Work a 3-stitch i-cord that is approx. 25 inches long. 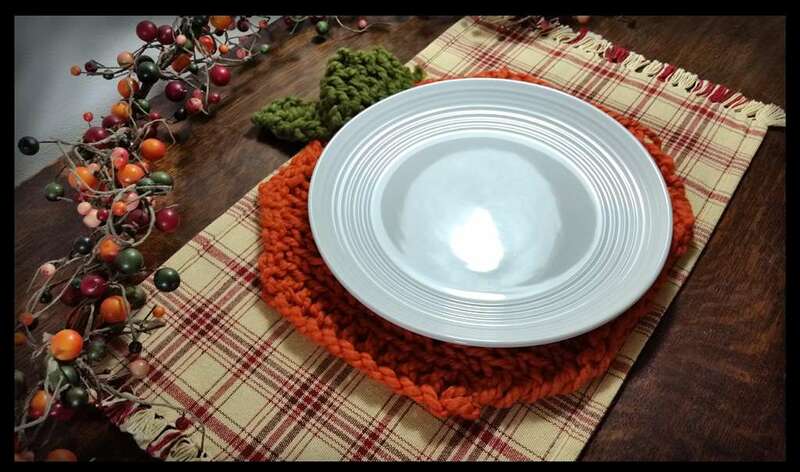 This month we will bring you small accents to decorate your kitchen, anywhere from dishclothes, hanging towels, to placemats and perhaps even a kitchen rug. 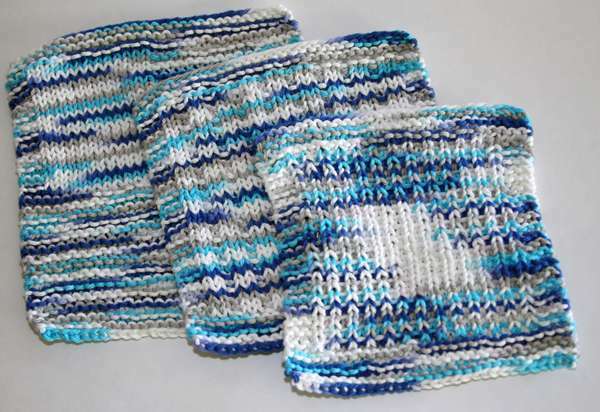 The Nautical Dishcloth set is the perfect way to add some color and to test out some new stitches. Remember, it is a dishcloth so perfection is not required, the dishes won’t mind if a stitch is amiss. Grab a loom and sit down outside to enjoy the spring air and knit away. Yarn: Approx 150 grams of cotton worsted weight yarn. Bernat Handicrafter Cotton in Nautical was used in sample. Gauge: Not imperative for project. K=knit stitch (or may substitute with U-stitch). 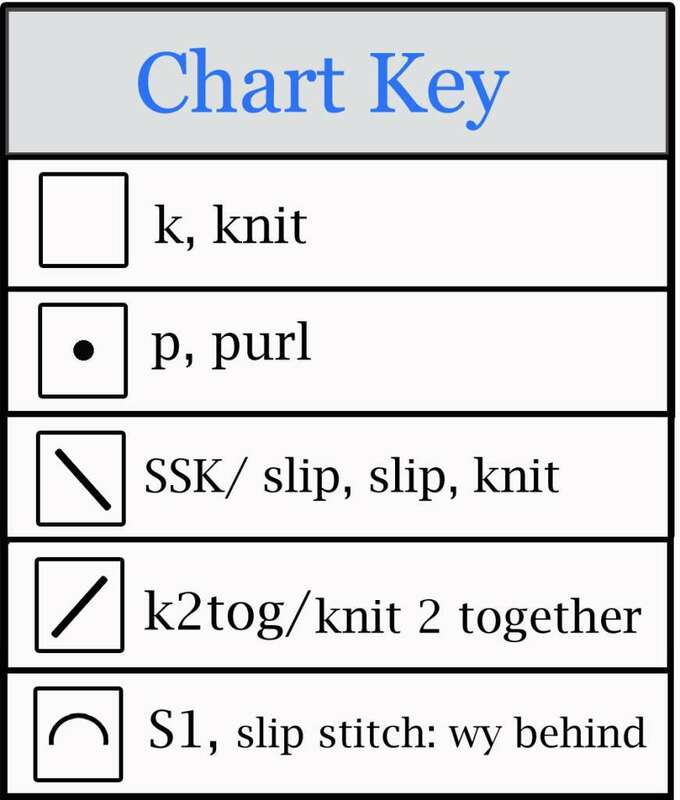 Sl 1 wyif=with yarn in front of the stitch (remove stitch from the peg, pass working yarn behind the peg, place stitch back on the peg, then work the next peg as instructed in pattern. Row 1 (from right to left): p to end of row. Row 4: k to end of row. Row 6: k to end of row. Row 7: p3, k13, p16. Rep Row 6 and Row 7: 10 more times (total of 20 rows). Next row (left to right): k to end of row. Rep last two rows: 10 more times (total of 20 rows). Rep last 2 rows: 2 more times. Remove with Basic bind off method. Cast on 32 sts, prepare to work a flat panel. Row 6: k3, *k2, p1; rep from * to last 5 sts, k5. Row 7: p3, k to last 3 sts, p3. Rep Rows 6 and 7: 18 more times (36 total rows). Next row: k to the end row. Next row: p to the end of row. Row 7: p3, *k1, sl 1 wyif, rep from * to last 4 sts, k1, p3. 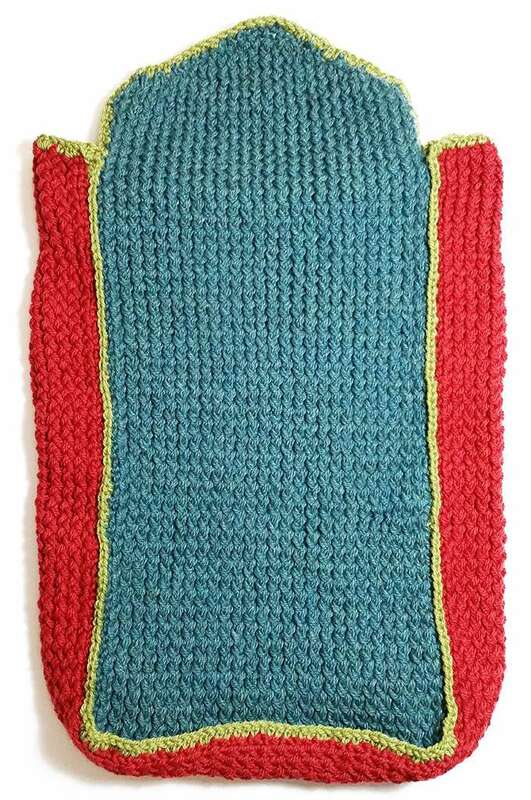 Work with the Ribbing stitch in this fun, colorful throw. 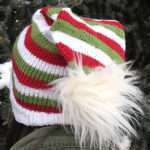 The bright colors and bold stripes make this a simple knit favorite and with the double knit, double the warmth! 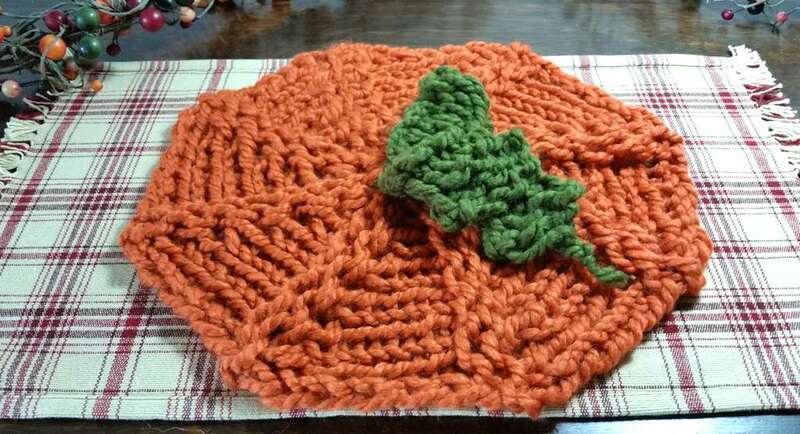 Use two strands of yarn as one, throughout the making of this throw. 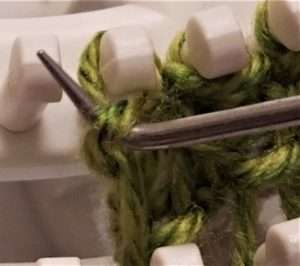 When you are knitting a solid color, for example, grape rib stitch, just use both ends of the skein of yarn, pulling one strand from the center and one strand from the outside. 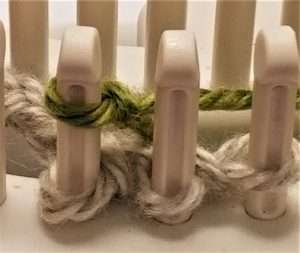 When using two different colors together, it will be much easier if you use one strand of each pulling from the center of the skein, which will keep them from tangling. 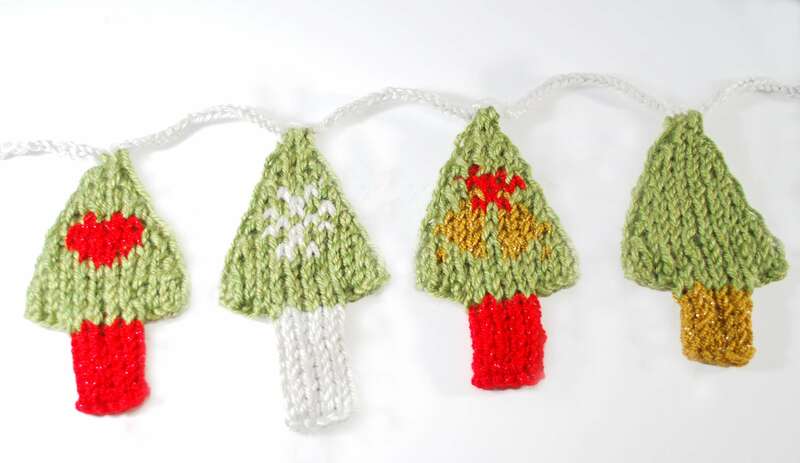 With each color change, cut yarn and knot after tying on the next color. Always tie on new color at 2nd stitch so that knots do not show from outer edge. 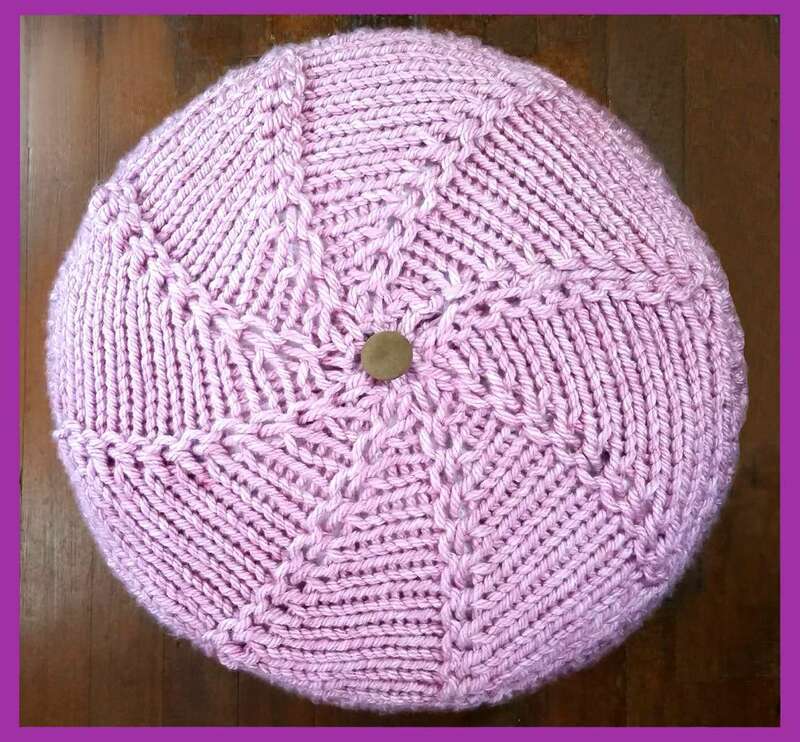 Cast on: 64 stitches in Stockinette stitch with Grape yarn. Lay contrasting anchor yarn. Note: Complete throw is worked in Rib Stitch until you come to the bind off row. 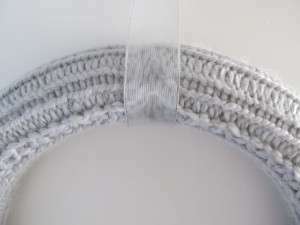 Rib Stitch: After the cast on, start first row by wrapping the top 1st peg and bring down to the bottom 3rd peg. You are skipping peg 1 and 2 on lower board. Your yarn is at an angle. Now go back up to top board to 3rd peg and wrap. 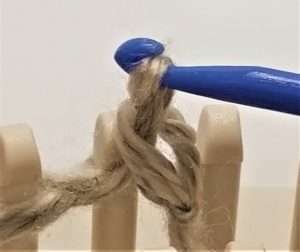 Take yarn down to lower 5th peg. Continue wrapping every other peg at this angle till you get to the end of your stitches. 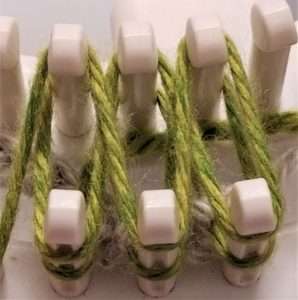 To return, take yarn around end of pegs to wrap the top last peg. Continue by wrapping all the empty pegs. You will see that you are going back with peg 1 to 3 again and working at the opposite angle. This is what creates the ribs. It is correct that the last pegs are wrapped consecutively. Hook over all pegs. 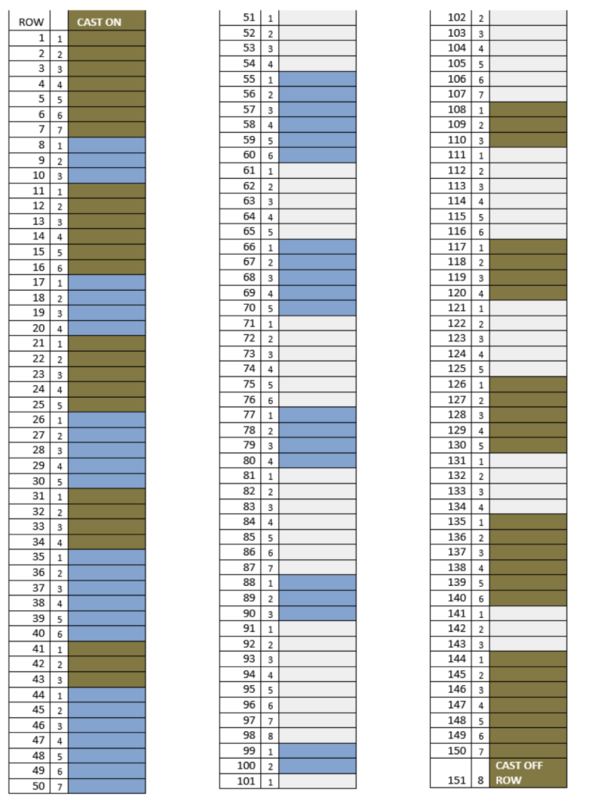 Repeat for each row according to color design. Knit 5 rows Grape yarn. Tie on Lime yarn. 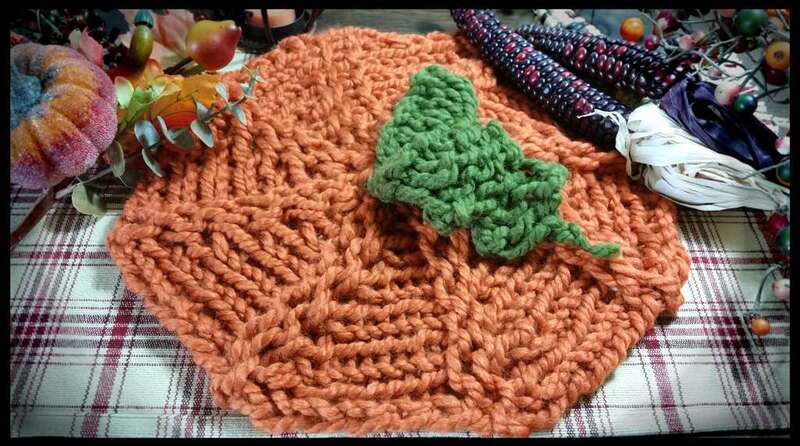 Do not cut the Grape, but carry it in along with Lime yarn. Knit 1 row in Lime. Cut Lime and knot. 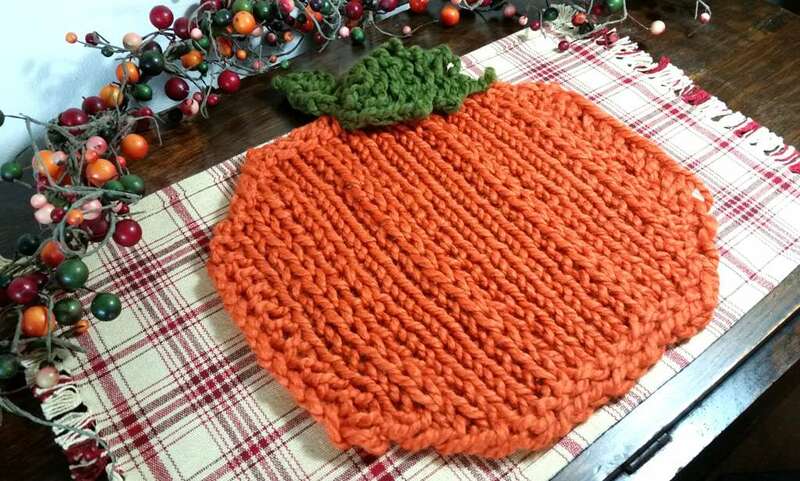 Knit 3 rows Grape. 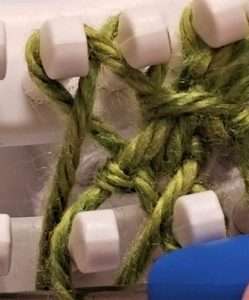 Tie in Lime yarn. Cut grape and knot. Knit 3 rows in Lime. Cut the one strand of yarn coming from the outside of the skein and tie on one strand of the Blue yarn from the inside of the blue skein. Treating the two yarns as one, knit 5 rows of Blue and Lime in rib. 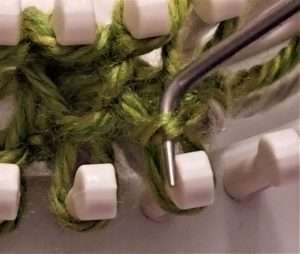 Cut and tie off the Lime yarn. Tie on the other end of the Blue yarn so that you now have both strands of Blue. Knit 5 rows in Blue. Cut the blue yarn and tie off. Tie on Yellow yarn. Knit 2 rows in Yellow. Cut and tie off the Yellow yarn. Tie on the Grape yarn. Knit 2 rows in Grape. Cut and tie off the Grape yarn. Tie on two strands of the Pink yarn. Knit 4 rows in Pink. Cut one strand of Pink yarn coming from the outside of the skein and tie on one strand of the yarn from the inside of the Tropical Pink skein. Treating the two yarns as one, knit 5 rows of Pink and Tropical Pink rib. 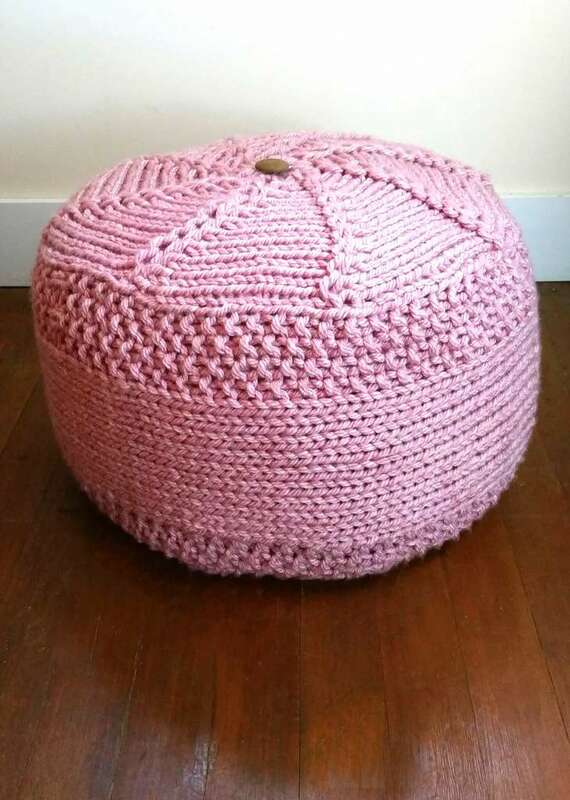 Cut and tie off the Pink yarn. Tie on the other end of the Tropical Pink yarn so that you now have both strands of Tropical Pink. Knit 5 rows of Tropical Pink. Cut both strands of yarn and tie off. Tie on 2 strands of Grape yarn. Knit 5 rows of Grape. Cut and tie off yarn. Tie on 2 strands of Pink. Knit 5 rows of Pink. Cut and tie off yarn. Tie on 2 strands of Blue. Knit 5 rows of Blue. Cut and tie off yarn. Tie on 2 strands of Tropical Pink. Knit 5 rows of Tropical Pink. Cut and tie off yarn. Tie on 2 strands of Lime. Knit 5 rows of Lime. Cut and tie off yarn. Tie on 2 strands of Grape. Knit 5 rows of Grape. Cut and tie off yarn. Tie on 2 strands of Tropical Pink. Knit 5 rows of Tropical Pink. Cut one strand of Tropical Pink yarn coming from the outside of the skein, and tie on one strand of the yarn from the inside of the Pink skein. Treating the two yarns as one, knit 5 rows of Pink and Tropical Pink. Cut and tie off the Tropical Pink yarn. Tie on the other end of the Pink yarn so that you now have both strands of Pink. Knit 4 rows of Pink. Cut and tie off yarn. Tie on 2 strands of Grape. Knit 2 rows in Grape. Cut and tie off the Grape yarn. Tie on the Yellow yarn. Knit 2 rows in Yellow. Cut and tie off the Yellow yarn. Tie on two strands of the Blue yarn. Knit 5 rows of Blue. Cut one strand of blue yarn coming from the outside of the skein and tie on one strand of the Lime yarn from the inside of the blue skein. Treating the two yarns as one, knit 5 rows of Blue and Lime. Cut and tie off the Blue yarn. Tie on the other end of the Lime yarn, so that you now have both strands of Lime. Knit 3 rows in Lime. Cut and tie off yarn. Tie on 2 strands of Grape. 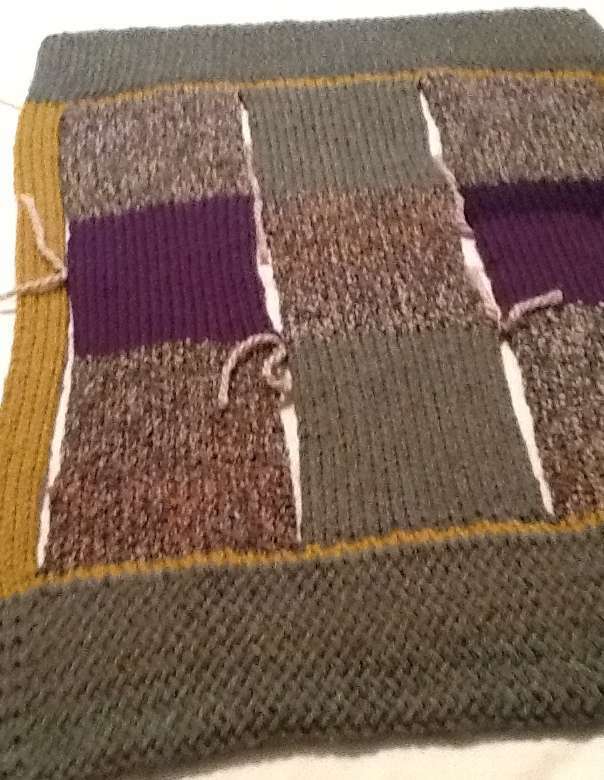 Knit 3 rows in Grape. Do not cut grape yarn but let it carry through. Tie on 2 strands of Lime and knit one row of Lime. 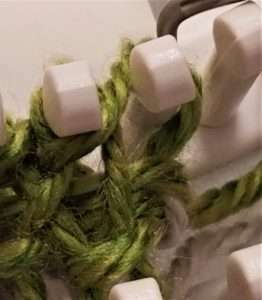 Cut and tie off Lime yarn. Knit 5 rows in Grape. Knit 1 row in Grape Stockinette stitch. Bind off the board remembering that you are still treating 2 strands as one, so each side of the board in which you are doing the crochet bind off, will have two loops. Weave in ends. Bind off the anchor yarn treating 2 strands as one. Lift two loops over two loops. Weave in ends. 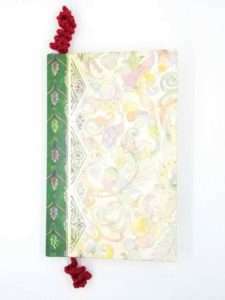 Basic Notes: With each color change, cut yarn and knot after tying on the next color. All stitches are Stockinette. Check out chart below. 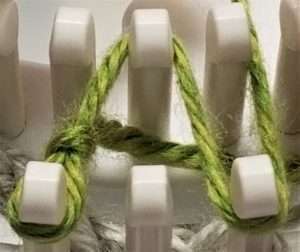 To keep side edges even and smooth, tie on your new yarns at 2nd stitch between the rows of pegs. 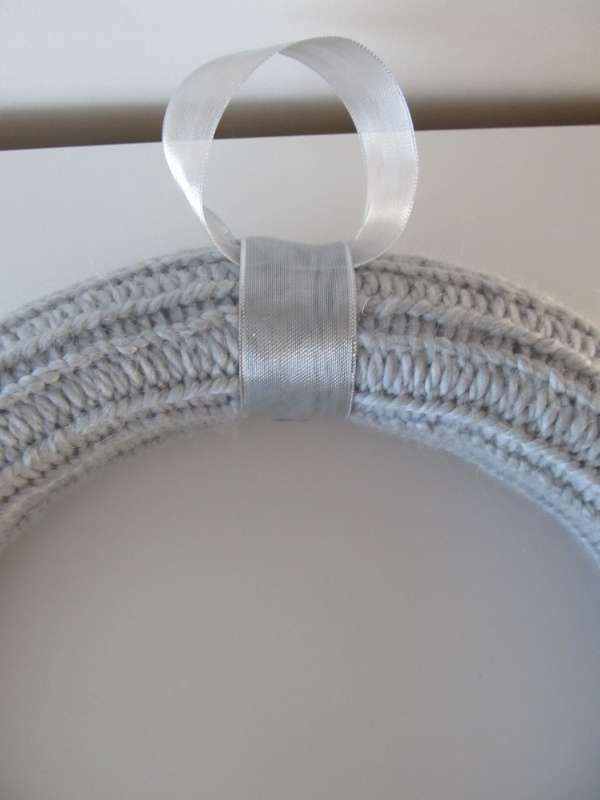 This will keep the knots away from the edge and hidden from the finished throw. When cutting each yarn, leave a yarn tail approximately 3” that will lay flat between the 2 rows of pegs. Cast on row will be the same as one row of stockinette stitch. 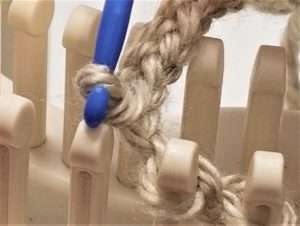 You start on Left side of loom on top peg #1 with a slip knot; bring yarn down to peg #2 on lower board. Wrap yarn around, and continue back up to peg # 3 on top board. 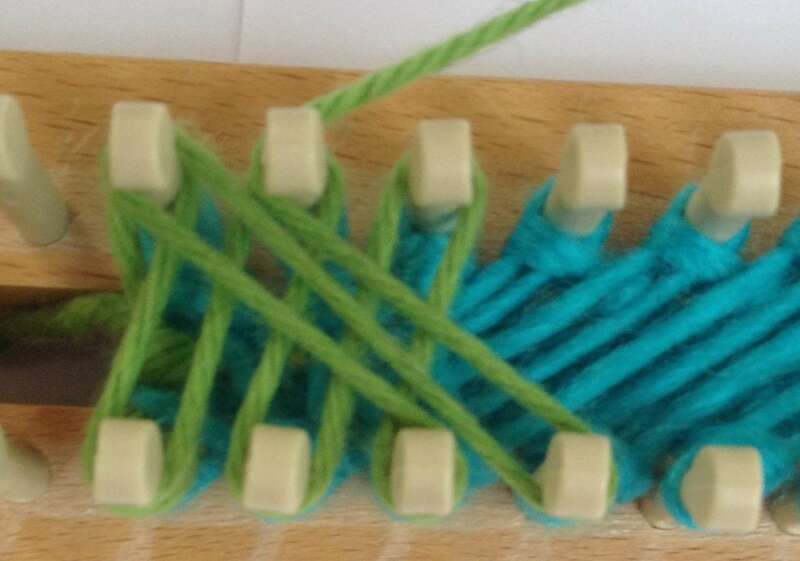 Continue weaving the yarn around every other peg, alternating from one board to the other, to end. Wrap around the end at last peg. Return back to beginning by wrapping all the pegs that were skipped on first pass. Now all the pegs for this project will be wrapped. 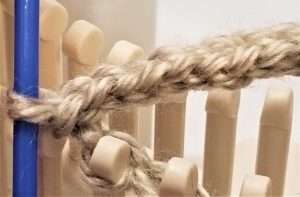 Lay a piece of yarn across the stitches with the yarn ends dangling at each end of loom. This is referred to as the anchor yarn or waste yarn. 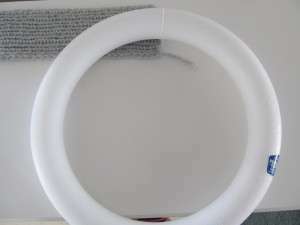 It is usually removed after the knitting is complete. Now, wrap all the pegs again just as before so that you have 2 loops on each peg. You are ready to hook over using the knit hook. 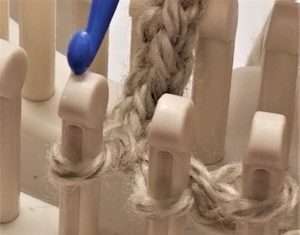 This means to lift the bottom loop, on each peg over the top loop, and into the center of the loom. 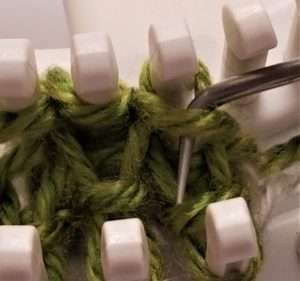 Do this to all pegs, so that they have only one wrap of yarn. Your stitches are now cast on and you are ready to work in stockinette stitch. 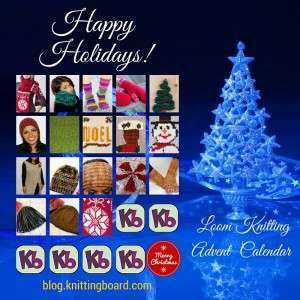 The stockinette stitch produces a smooth knit, and is usually the first stitch learned in double knitting. It is the same process as casting on. Once you wrap all pegs again, hook over. This completes one row of stockinette stitch. Continue this stitch with the color changes for the entire afghan. Cast on 64 stitches with Camel yarn in Stockinette stitch. Lay contrasting anchor yarn. Knit 7 rows in Camel. Tie in Blue yarn. Cut Camel and knot. Knit 3 rows in Blue. Tie in Camel yarn. Cut Blue and knot. Knit 6 rows in Camel. Tie in Blue yarn. Cut Camel and knot. 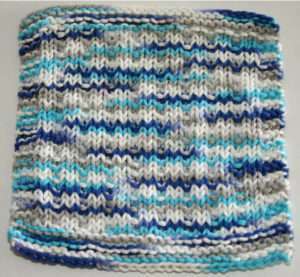 Knit 4 rows in Blue. Tie in Camel yarn. Cut Blue and knot. Knit 5 rows in Camel. Tie in Blue yarn. Cut Camel and knot. Knit 5 rows in Blue. Tie in Camel yarn. Cut Blue and knot. Knit 4 rows in Camel. Tie in Blue yarn. Cut Camel and knot. Knit 6 rows in Blue. 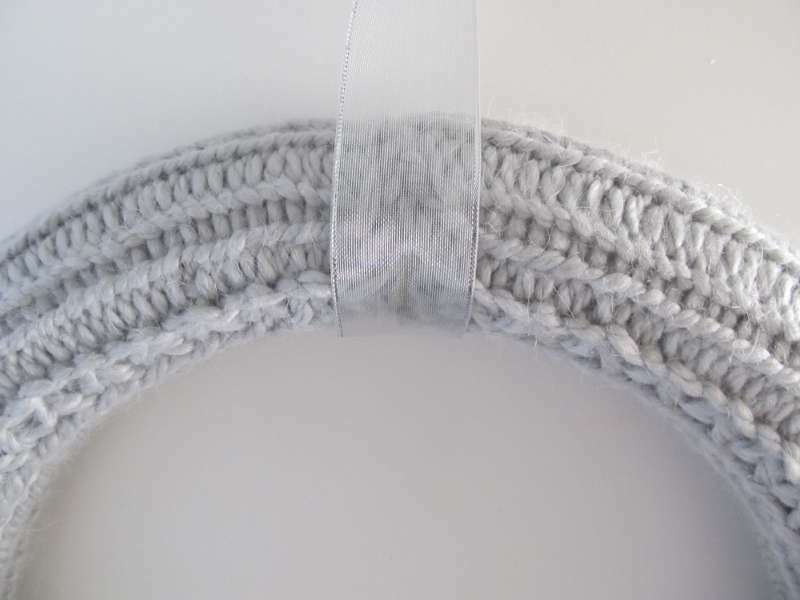 Tie in White yarn. Cut Blue and knot. Knit 3 rows in Camel. Tie in Blue yarn. Cut Camel and knot. Knit 7 rows in Blue. 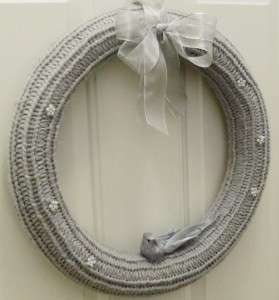 Tie in White yarn. Cut Blue and knot. 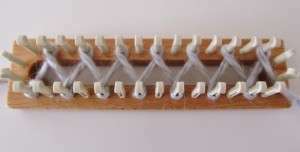 Knit 4 rows in White. Tie in Blue yarn. Cut White and knot. Knit 5 rows in White. Tie in Blue yarn. Cut White and knot. Knit 5 rows in Blue. Tie in White yarn. Cut Blue and knot. Knit 6 rows in White. Tie in Blue yarn. Cut White and knot. 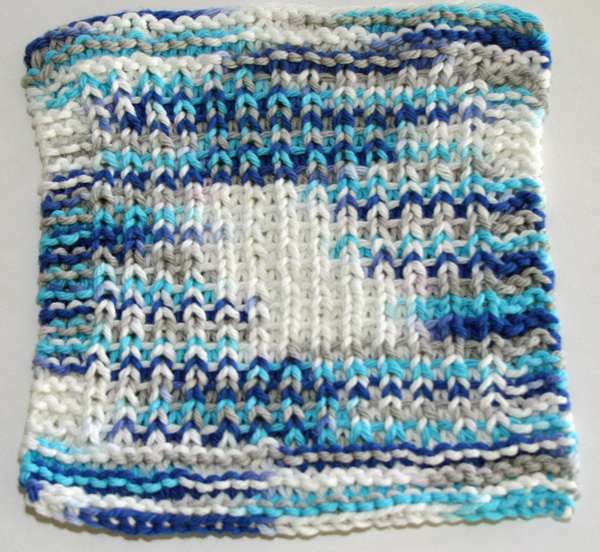 Knit 4 rows in Blue. Tie in White yarn. Cut Blue and knot. Knit 7 rows in White. Tie in Blue yarn. Cut White and knot. Knit 3 rows in Blue. Tie in White yarn. Cut Blue and knot. Knit 8 rows in White. Tie in Blue yarn. Cut White and knot. 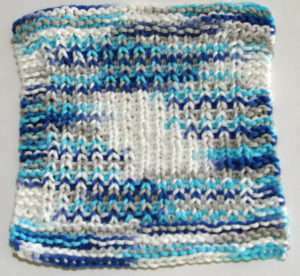 Knit 2 rows in Blue. 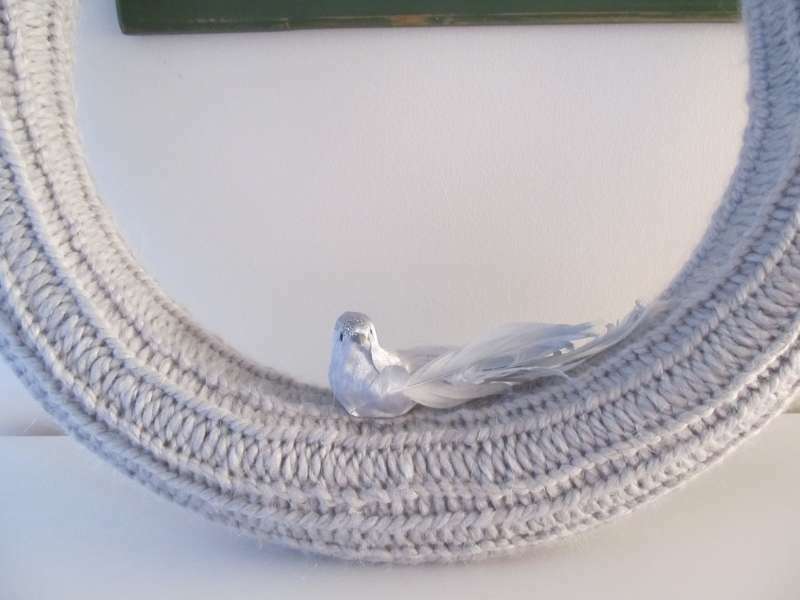 Tie in White yarn. Cut Blue and knot. Knit 7 rows in White. Tie in Camel yarn. Cut White and knot. Knit 3 rows in Camel. Tie in White yarn. Cut Camel and knot. Knit 6 rows in White. Tie in Camel yarn. Cut White and knot. Knit 4 rows in Camel. 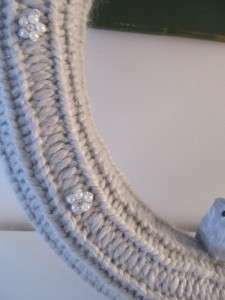 Tie in White yarn. Cut Camel and knot. Knit 5 rows in White. Tie in Camel yarn. Cut White and knot. Knit 5 rows in Camel. 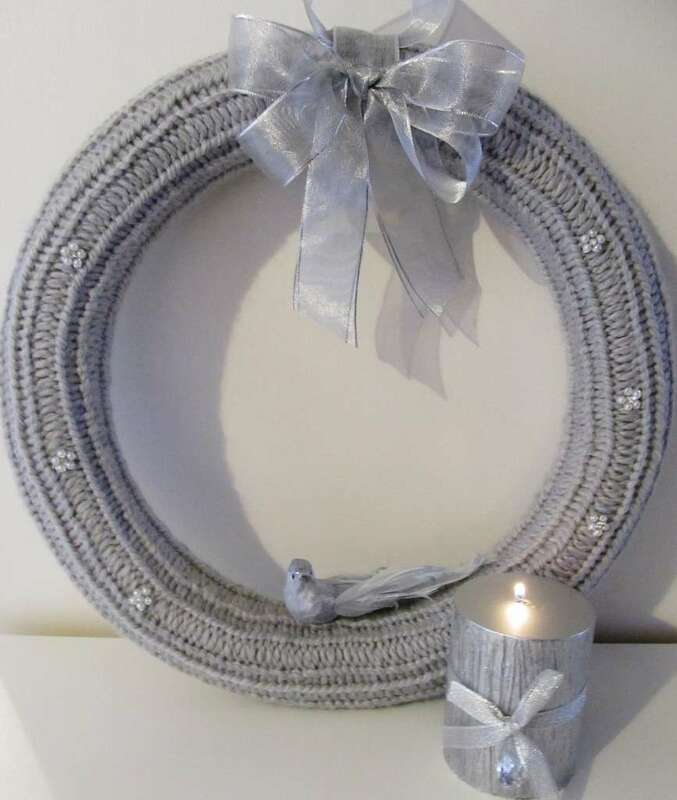 Tie in White yarn. Cut Camel and knot. Knit 4 rows in White. Tie in Camel yarn. Cut White and knot. Knit 6 rows in Camel. 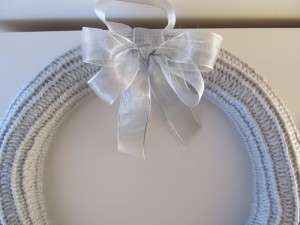 Tie in White yarn. Cut Camel and knot. Knit 3 rows in White. Tie in Camel yarn. Cut White and knot. Knit 8 rows in Camel. 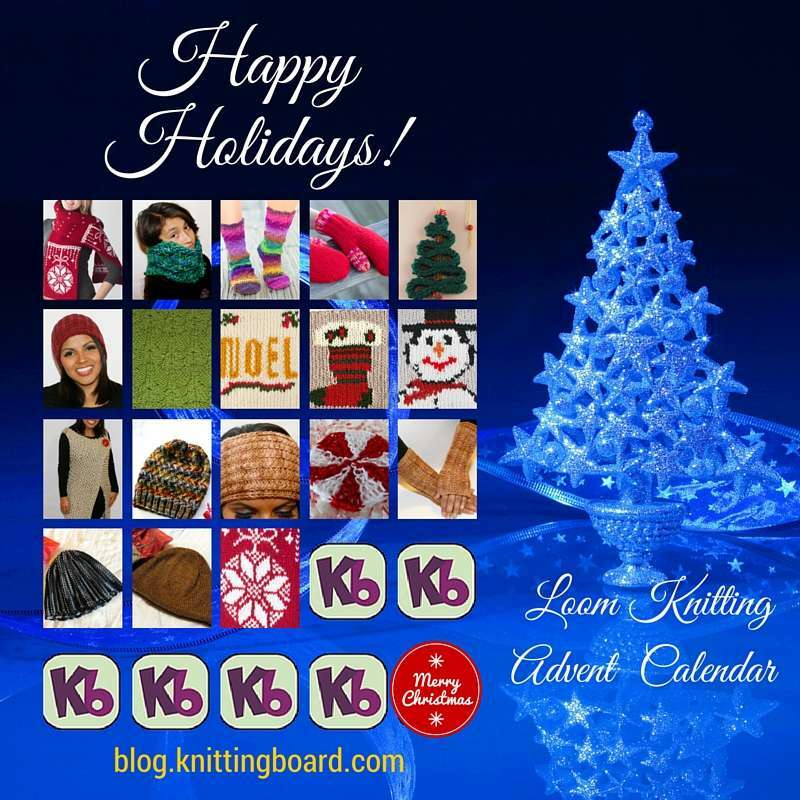 Bind Off your stitches with a loose crochet bind off. Bind Off at anchor yarn with loose crochet bind off. Now that the blanket is complete, finish off with this method. 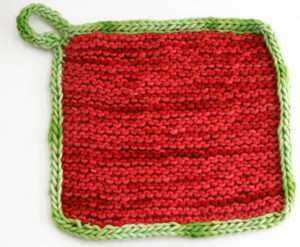 Place blanket in pot or sink with hot water for 4 minutes. Allow yarn to fully soak up all the water. Remove from sink and gently roll in a full size towel or two to absorb as much of the water as possible. Place in your dryer for five minutes on medium heat to fluff and soften the wool. Block to specified size and allow to air dry until fully dry. Enjoy your lovely throw! Envelope yourself this fall in a luxuriously soft blanket. 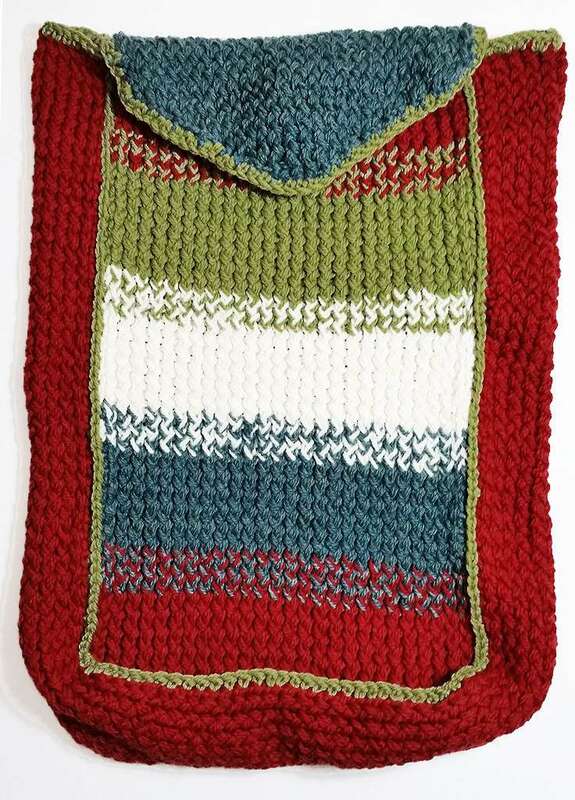 Cooler temperatures call for warm, cozy knits, this double knit blanket is easy and fast to knit up. 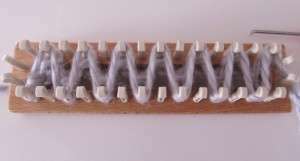 Knitting Loom: 28” Knitting Board + extenders , spacer set at 2cm. Yarn: Approx 925 yards of bulky weight yarn. Sample used Lion Brand Homespun in Waterfall color (5 skeins). Size: Approx 45 x 50 inches. Cast on 64 pegs with the basic cast on method. 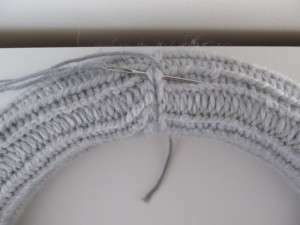 Continue working in stockinette stitch until item measures 45 inches from cast on edge. Create 6-inch fringes and add them to the cast on edge and bind off edge. 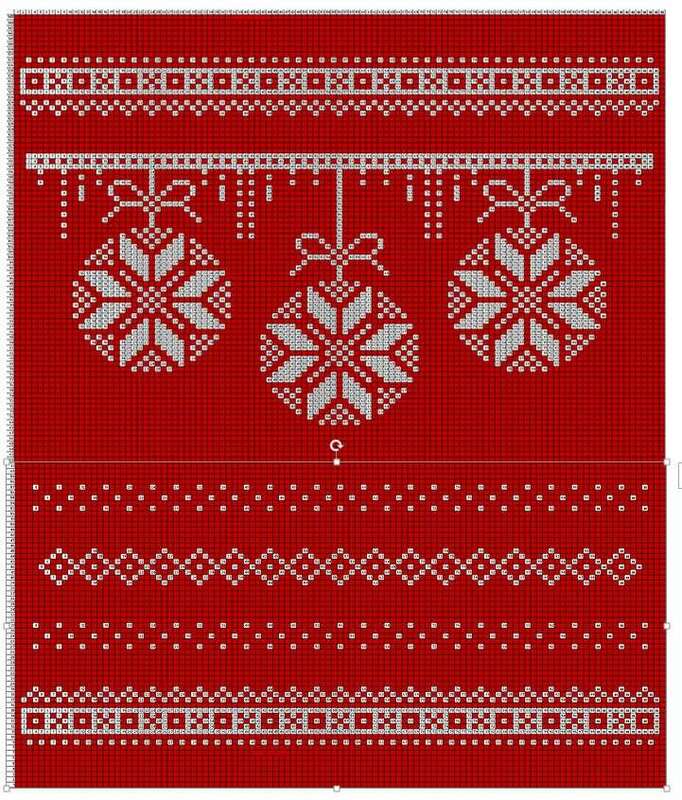 Suggest to add them every other stitch for a fuller fringe effect. Sometimes simple is best. Does anybody ever put how much time it takes to do some of these projects, it would be helpful. 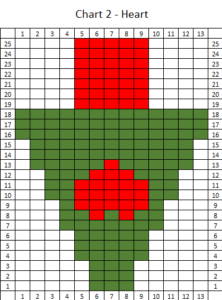 Can the KB S-shaped loom be used to make this Quiet Moments blanket instead of the loom called for in the instructions? 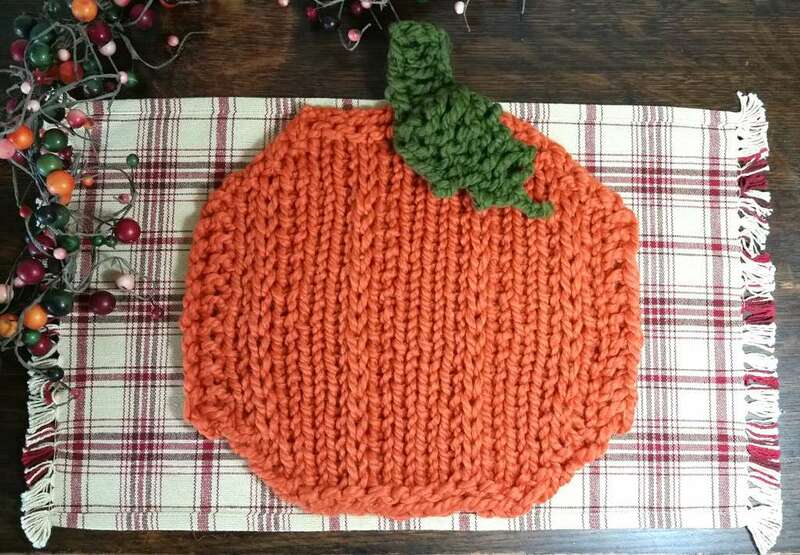 Fall has arrived, it is time for long evenings on the porch sipping a warm cup of tea, wrapped in a cozy, warm blanket. 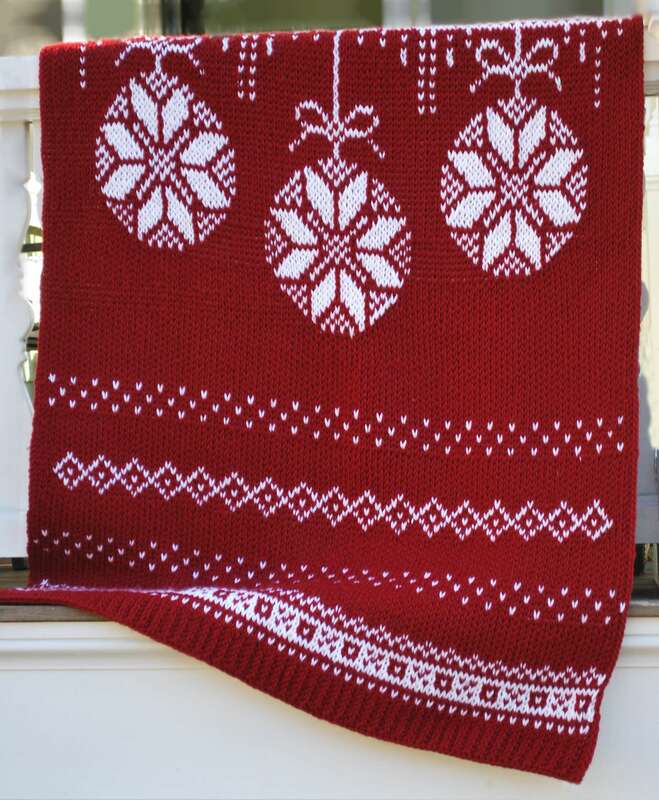 The White Pines Blanket uses the new Zippy looms to create a cozy thick blanket that knits up in a couple of days. 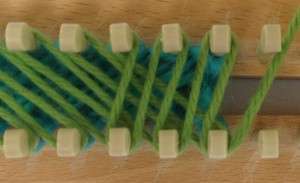 Knitting loom: Zippy Loom (7 Zippys). Cast on 27 sts (from left to right). Row 2: Sl1, p to last stitch, k1. **Row 3: Sl1, k to the end of row. Row 4: Sl1, p to last st, k1. Row 5: Sl1, k to the end of row. Row 6: Sl1, p to last st, k1. Row 7: Sl1, k1, k2tog, k2tog, [yo, k1]3x, yo, ssk, ssk, k1, k2tog, k2tog, [yo, k1]3x, yo, ssk, ssk, k2. Row 8: Sl1, p1, k to last 2 sts, p1, k1. Next row: Sl1, k to the end of row. Rep last two rows: 3x more. Mattress stitch seam both panels together. Weave ends in. Block if necessary. 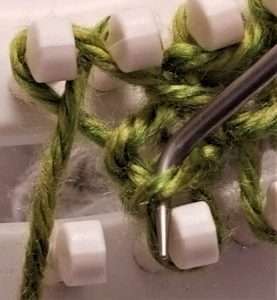 First, we will move the stitches to the different pegs, to leave pegs open for the yarn overs. After all the stitches have been moved to the appropriate pegs, then you will work the row. Step 1: Remove loop off peg 3 and hold it. Step 2: Move loop from peg 4 to peg 3. Step 4: Remove loop off peg 5 and hold it. Step 5: Move loop from peg 6 to peg 4. Step 7: Move loop from peg 7 to peg 6. Step 8: Remove loop off peg 13 and hold it. Step 9: Move loop from peg 12 to peg 13. Step 11: Remove loop off peg 11 and hold it. Step 12: Move loop from peg 10 to peg 12. Step 14: Move loop from peg 9 to peg 10. Step 15: Remove loop off peg 15 and hold it. Step 16. 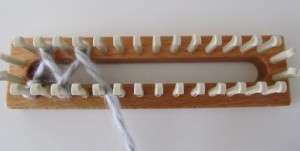 Move loop from peg 16 to peg 15. Step 18: Remove loop from peg 17 and hold it. Step 19: Move loop from peg 18 to peg 16. Step 21: Move loop from peg 19 to peg 18. Step 22: Remove loop off peg 25 and hold it. Step 23: Move loop from peg 24 to peg 25. Step 25: Remove loop off peg 23 and hold it. Step 26: Move loop from peg 22 to peg 24. Step 28: Move loop from peg 21 to peg 22. Empty pegs: peg 5, 7, 9, 11, 17, 19, 21, and 23. 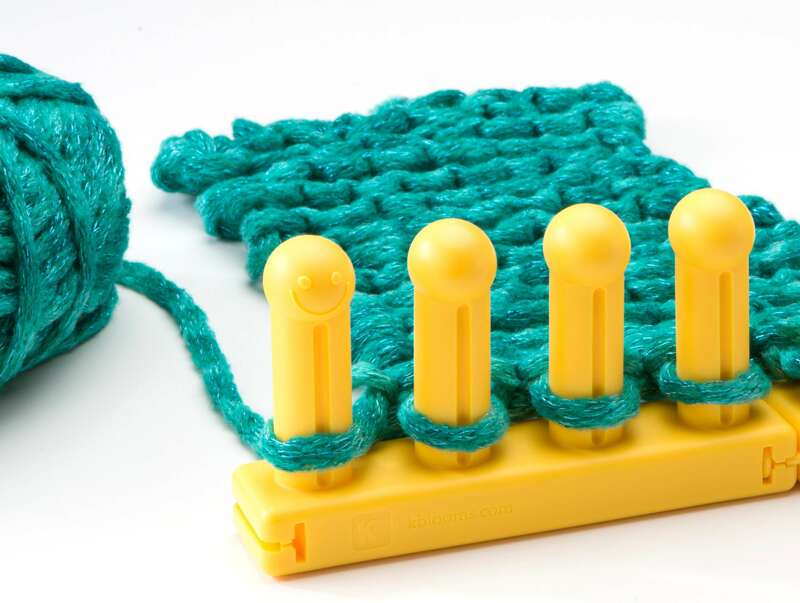 Step 29: Knit the row (treat the pegs with two loops on the peg as one loop, ewrap the empty pegs). 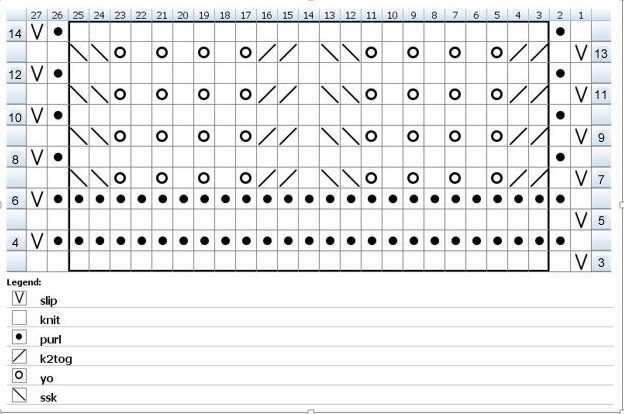 Chart shows Rows 3-14 of the pattern instructions. Are there any videos for these projects? Kelly, no, there are no videos for the projects. 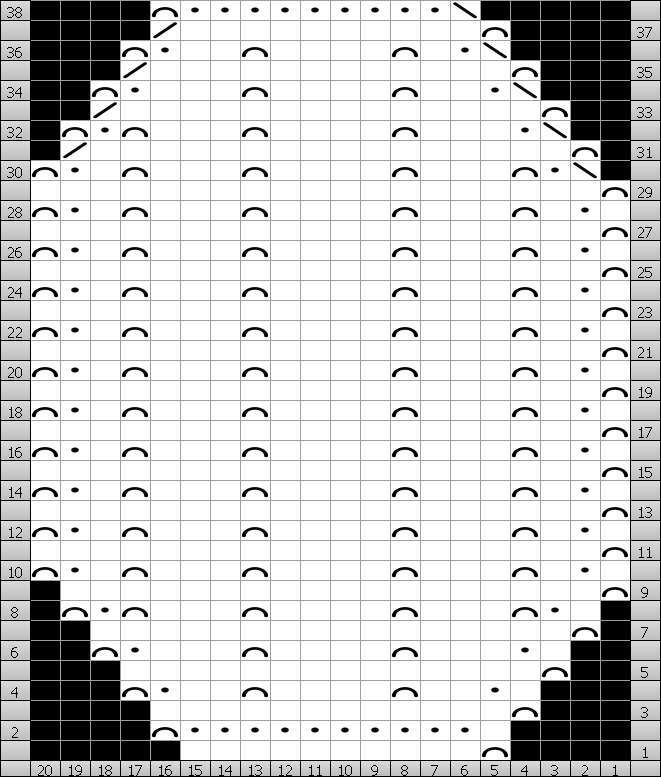 There is a breakdown of row 7 at the bottom of the pattern. It is broken down step-by-step. What part of the breakdown are you needing help with? My apologies. I didn’t realize it was a breakdown. I thought it was separate rows. I will give it a try. Thanks for you quick response. Hi I’m very new to knitting looms and so far I love it. My one problem is that I don’t know how to join two different yarns together to either change colors or to continue to make it a larger project when I run out of yarn. 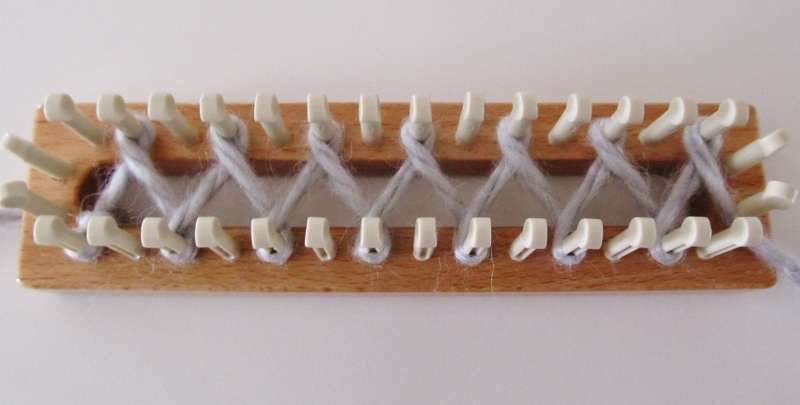 I know how to join on a normal double side peg board-loom for double knits and socks from all the videos and books I have. 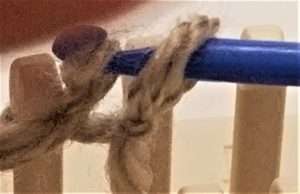 (I’m more of a visual learner) However I can’t find any information on how or where to do this on a one side peg broad like the Zippy loom. If you can help me I would really appreciate because I want to finish my project soon. Winter is coming! 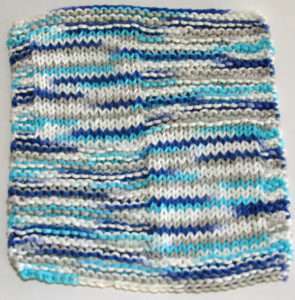 Knit in fun colors with stripes and large circles giving lots of colorful variations just like gentle waves. 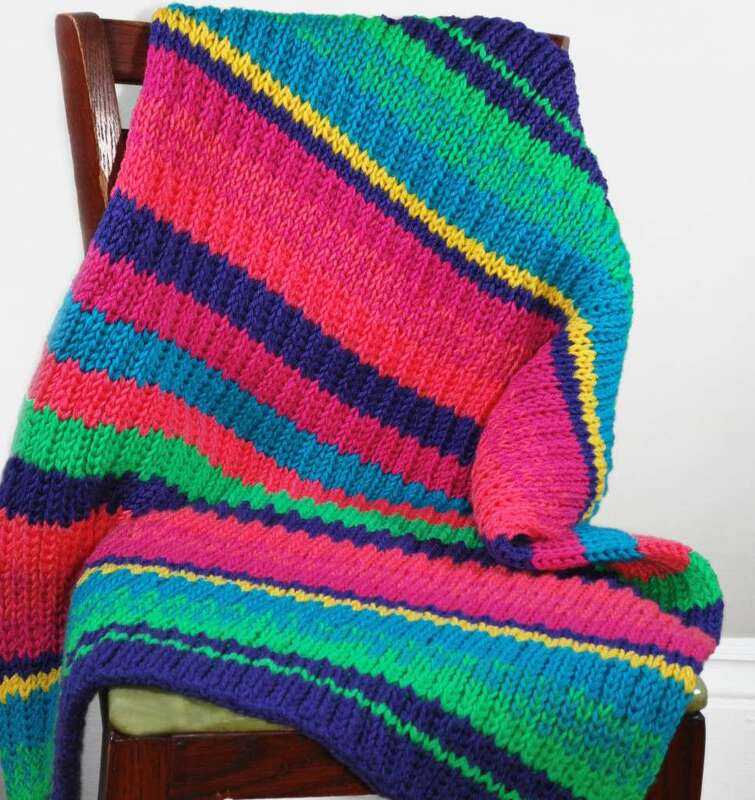 This afghan is knit in three pieces and sewn together matching the stripes so that it looks to be in 1 large piece. Center Section is worked on full width of loom or 62 stitches. Cast On 62 stitches in Stockinette with main color yarn (B). Lay anchor yarn. Tie on (P) yarn at 3rd stitch in center of loom. You can leave the (B) yarn attached as the stripes are only 5 rows. Work (3) rows in Stockinette in (P) yarn. Cut with 3” tail. Tie on (A) yarn at 3rd stitch in center of loom and tie it also to tail of (P) yarn. Lay tails inside between the pegs. Work 2 rows in Stockinette. Cut and tie on to main yarn (B). Continue working with main yarn for 2 additional rows. Begin the circles. You can follow the diagram row by row to work the circle rows. Explanation of circle rows: Each circle will be 10 sts wide at widest point and 10 rows at widest point. Each side edge (B) will be 5 sts with 4 stitches between the circles at widest point. We used a separate strand of yarn for the 4 circles, so tie on a separate skein for each circle. We carried the main yarn thru the circles maintaining Stockinette weave. This will give the afghan more stretch in this area. Work the color sts in Stockinette also. Cut and tie off each accent color yarn. Work 1 row with (B) yarn. Repeat the circle rows by tying on the accent colors, but use the accent colors in opposite locations to have the colors alternating. Work (2) rows with (B) yarn. Tie on (P) yarn at 3rd st and work 2 rows. Cut and knot. Tie on (A) yarn at 3rd st and work 3 rows. Cut and knot. **Work 20 rows with (B) yarn. 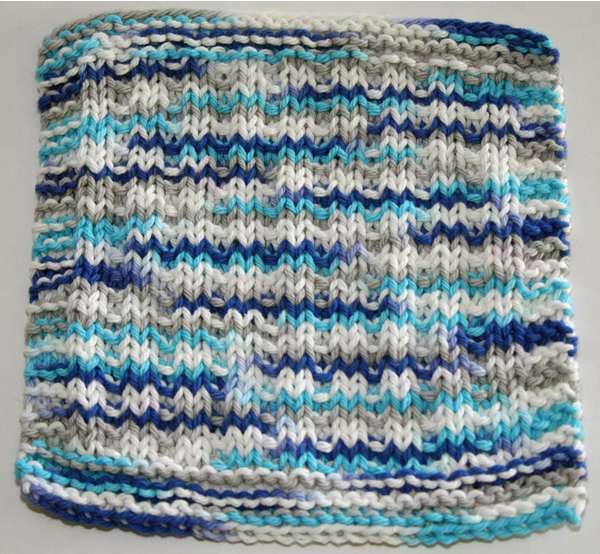 **Repeat the stripe rows using both accent colors, for 5 rows, 2 (P) and 3 (A). Repeat the ** rows 2 additional times ending with the 5 rows of stripes. Tie off the accent colors. Work 2 rows (B) yarn. Repeat the entire section of Circles. Work 3 rows (P) yarn. Work 10 rows with (B) yarn. Cut yarn leaving a 3” yarn tail. Bind Off with 2 loop method using crochet hook. Start at end opposite the yarn tail. Once afghan is off loom, knot last loop using the yarn tail. Bind Off at anchor yarn with 2 loop method. Knot by pulling yarn tail thru last loop. 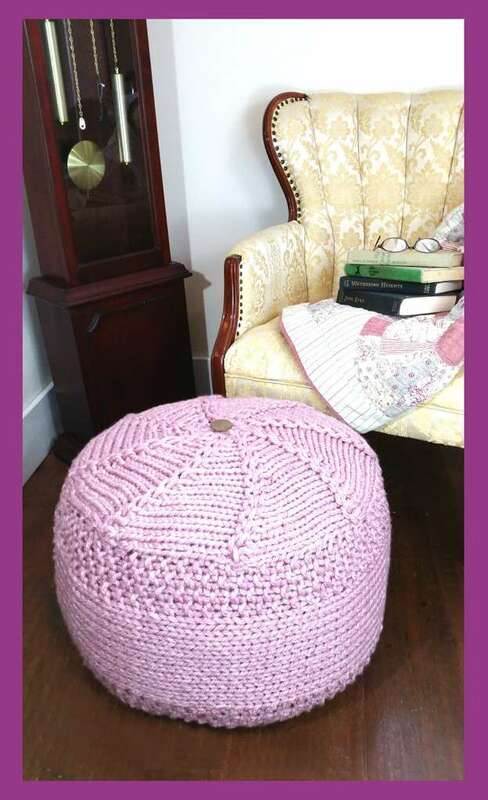 You can tuck in any yarn tails into the afghan with crochet hook. Side panels are knit to widen the size of the afghan. Be sure to follow the accent colors of the stripes so that they match when sewn together. 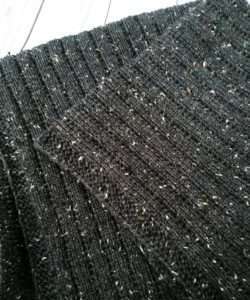 The outer edges also have been knit with a placket edge to give a nice feel to the balance of the afghan once complete. Cast on 16 sts. Lay anchor yarn. 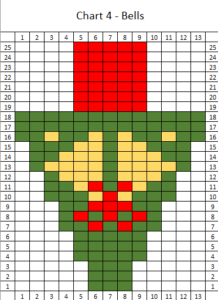 Be sure to mirror the amount of rows and colors as on the center section. Left side panel: Work placket on left edge. 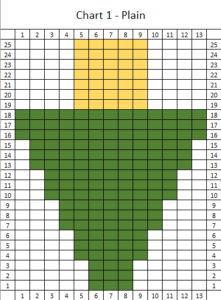 Work 10 rows (B), 3 (P), 2 (A), 25 (B), 2 (P), 3 (A), 20 (B), 2 (P), 3 (A), 20 (B), 3 (A), 2 (P), 20 (B), 3 (A),2 (P), 25 (B), 2 (A), 3 (P), 10 (B). Right side panel: Same except do placket on right edge. Lay out the sections to confirm that all stripes match. 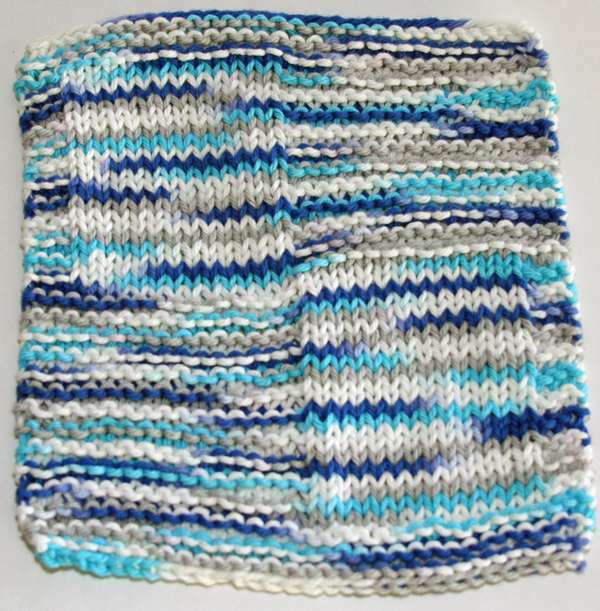 Do a whip stitch at each stripe to maintain the spacing. 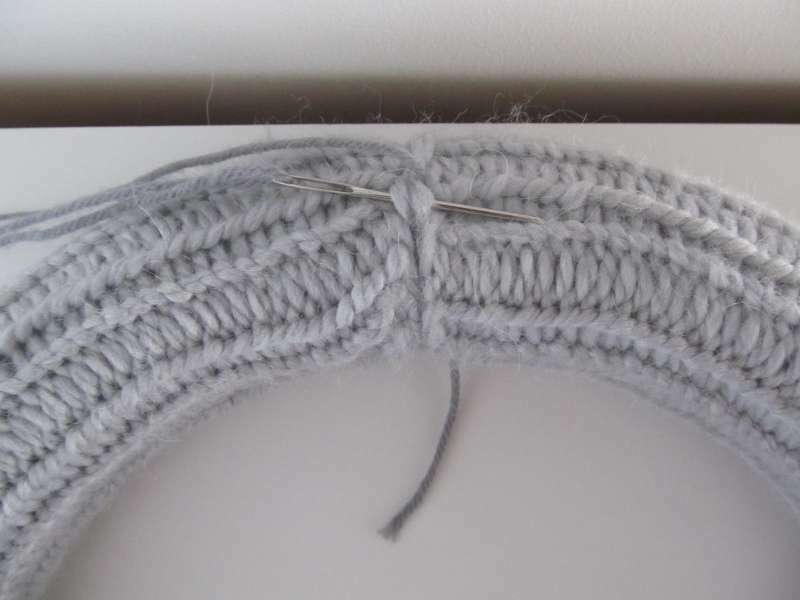 Using a large eyed darning needle and (B) yarn, sew the side sections to the center section. 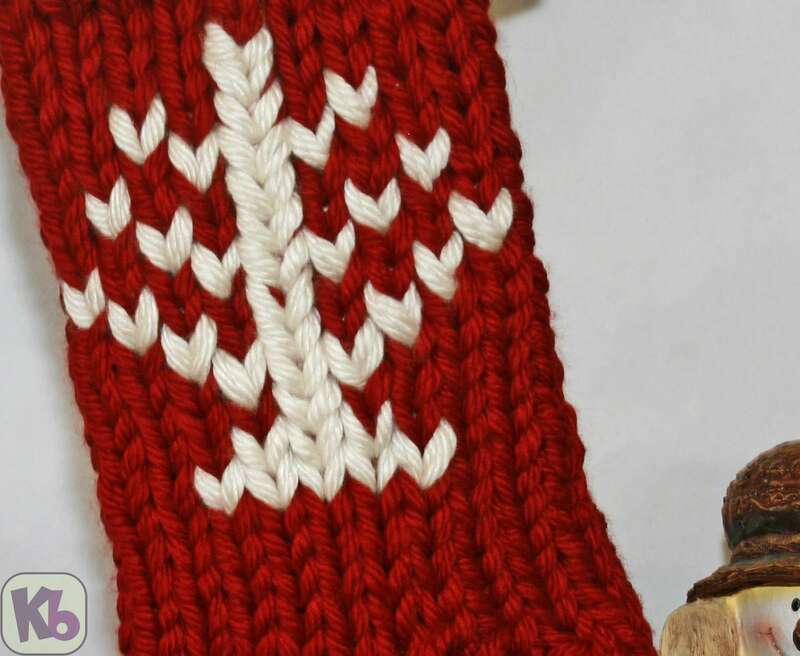 Be sure to do this with the invisible stitch by picking up the cross stitches on each edge. This lays in the center of the knitted edge. Once complete, you will not be able to find the seams. You can remove the whip stitch as you come to them, as they are not needed once the pieces are sewn with the invisible stitch. Tuck in any remaining yarn tails into knit for a finished afghan. 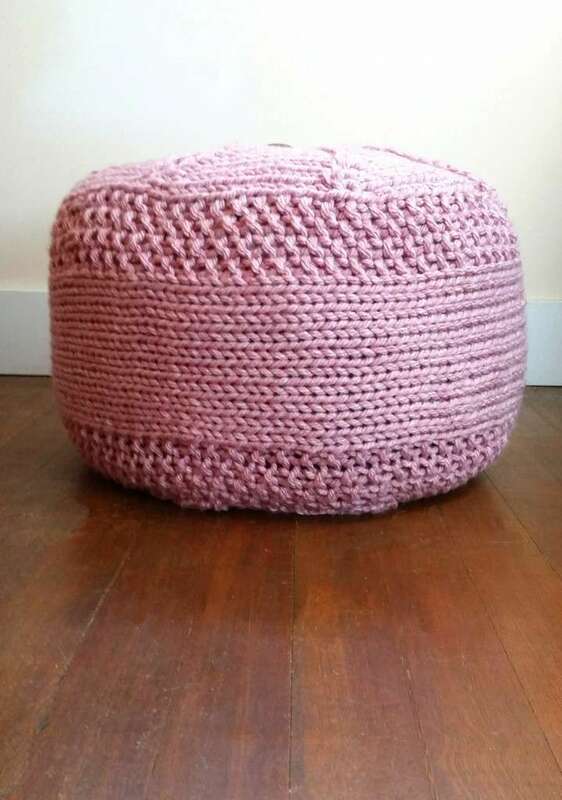 Could this be made on the Afghan loom or the aio, too? 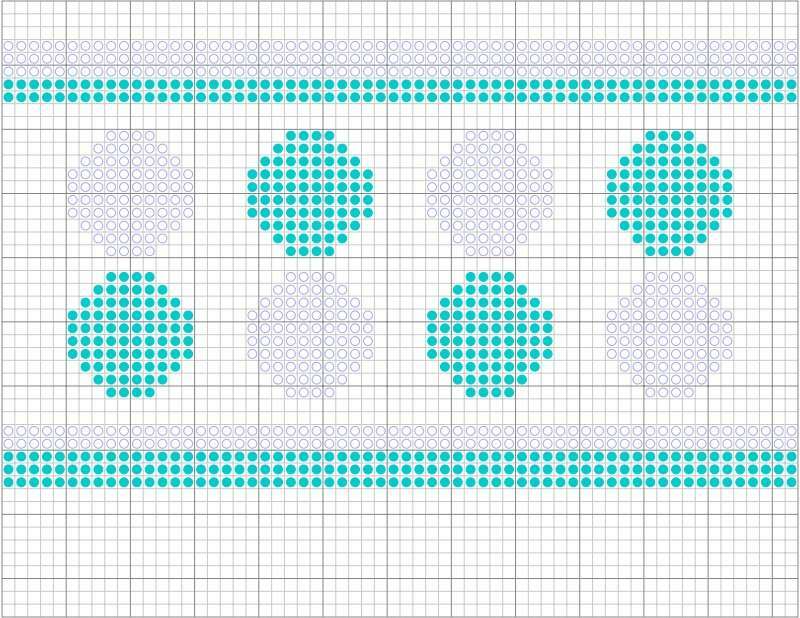 Thank you for sharing, when I get better at this, I will want to try this pattern, could this pattern also work on the 38″ Afghan board? Please let me know, thank you again. 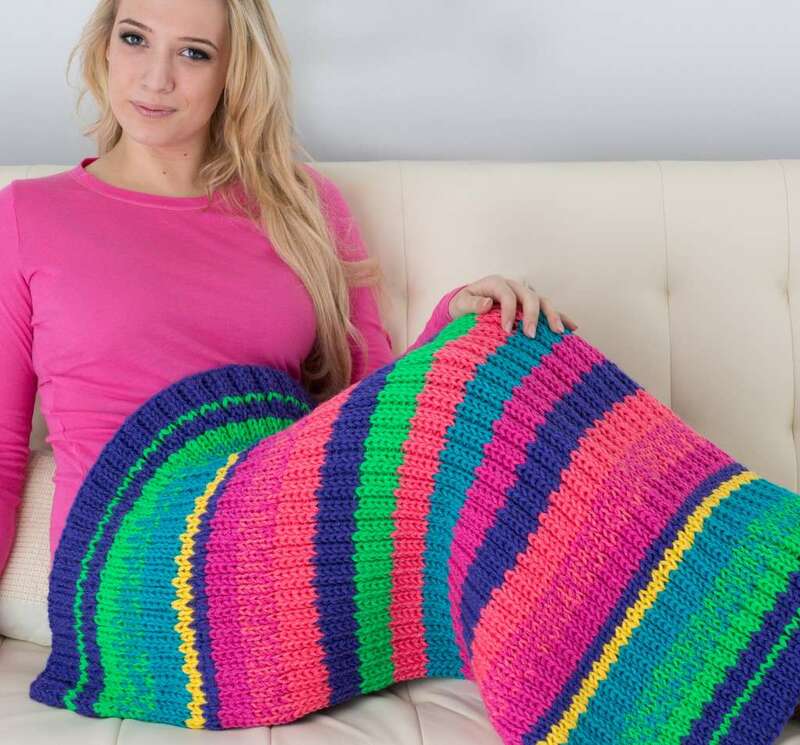 Hi Carolann, yes this afghan can be made on the 38″ knitting board with tightest spacer setting. Hi Jonnita, The afghan circular loom is designed for single knit, but you can still do double knit on the AllnOne loom but your center piece would be more narrow and you would have, probably,just 3 circles. 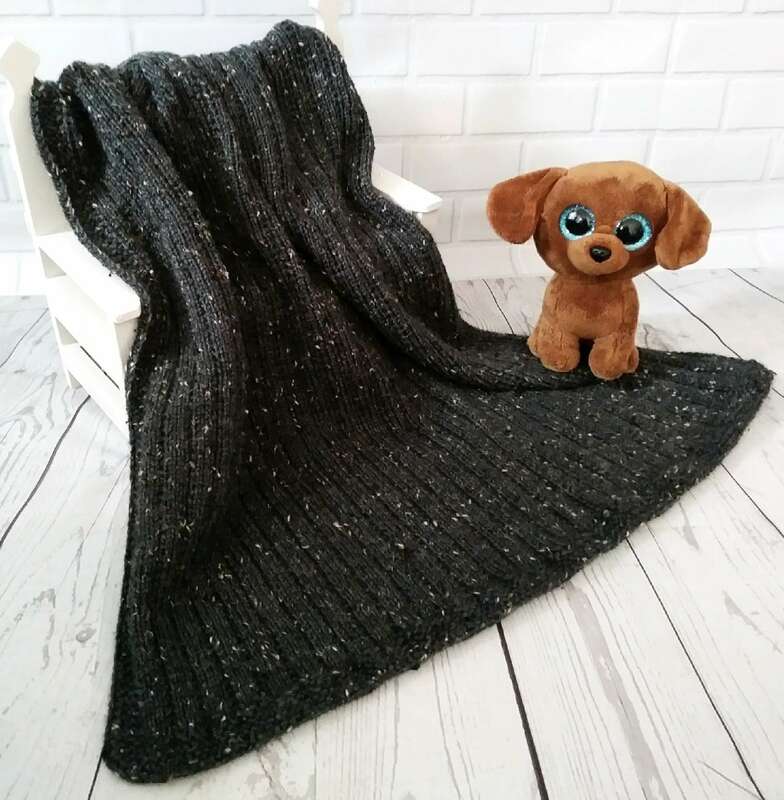 A nice smaller afghan. Thank you Pat, I think that is what I will do, and later I will purchase the 28″ loom; I am getting the 38″ Afghan loom at HSN, their are having a flex with it, also I am also getting your new hat loom too, again thanks for all the looms you have put together. Thanks Bethany, Working in double knit makes this type of designs, easier to do.